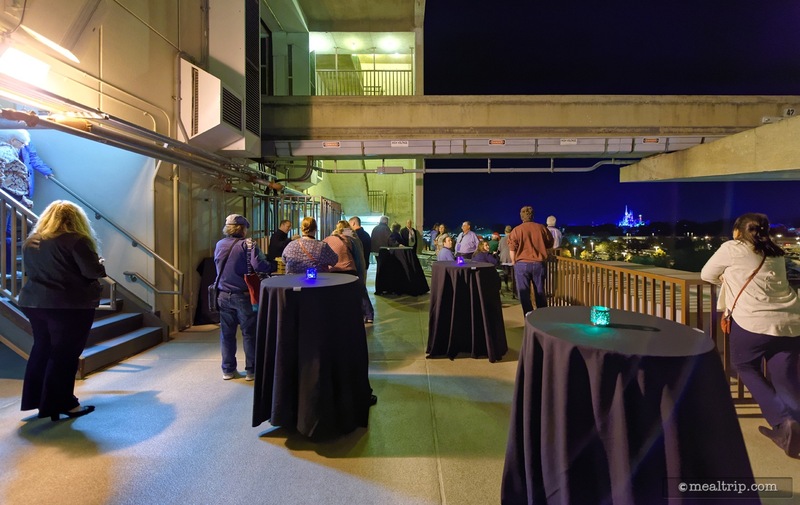 The Highway in the Sky Dine Around listing is a Special Event dining location at Disney's Contemporary Resort featuring American, Wine, Beer, Spirits or Beverage-based cuisine. There are 78 photos in the Mealtrip photo gallery for this location and dining period. 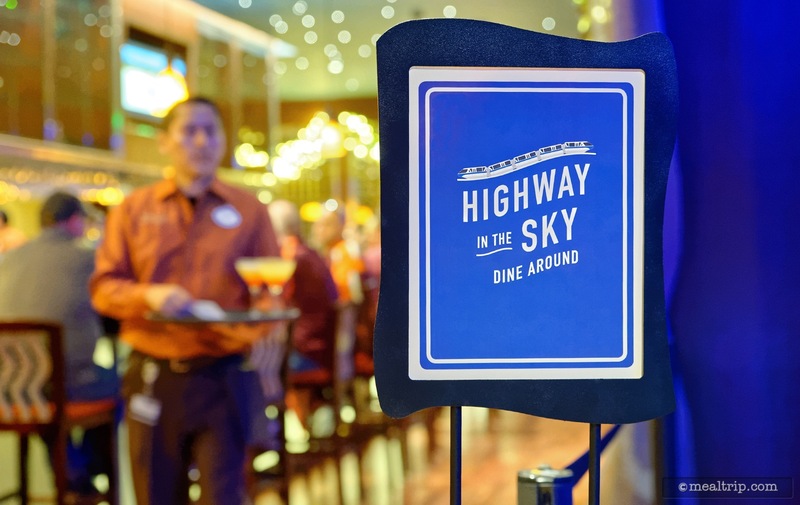 The Highway in the Sky Dine Around listing currently has a score of 79 out of 100. 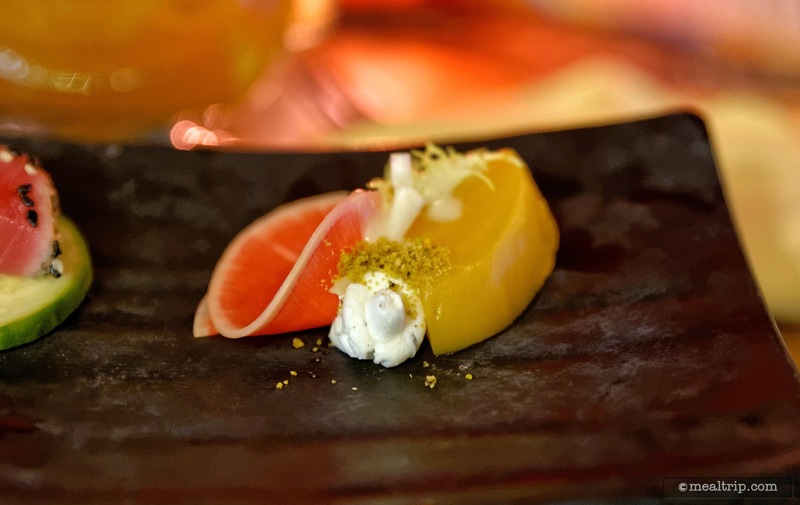 Click here to read all of the reviews for this location, or log in to Mealtrip.com to add your own review for Highway in the Sky Dine Around. 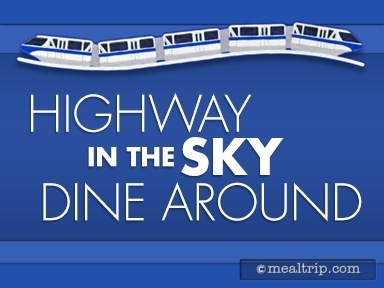 The Highway in the Sky Dine Around experience starts at the Contemporary Resort. 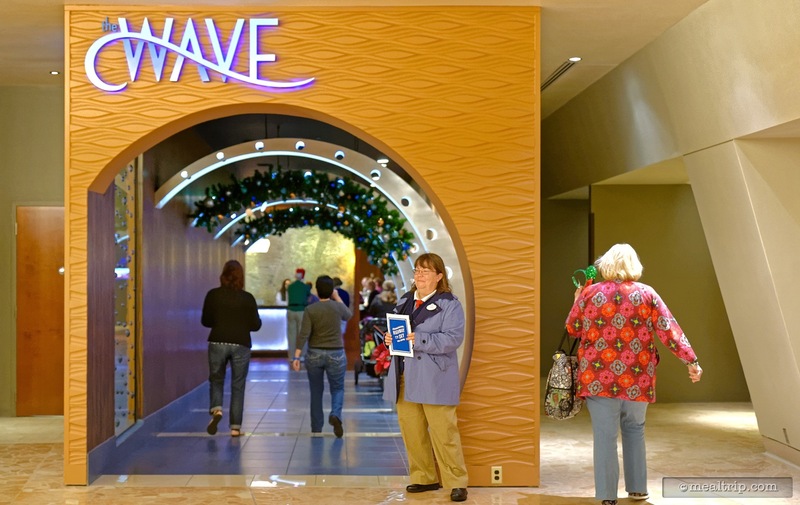 Check-in for the Highway in the Sky event is located at the end of this long tube at the Wave's check-in desk. 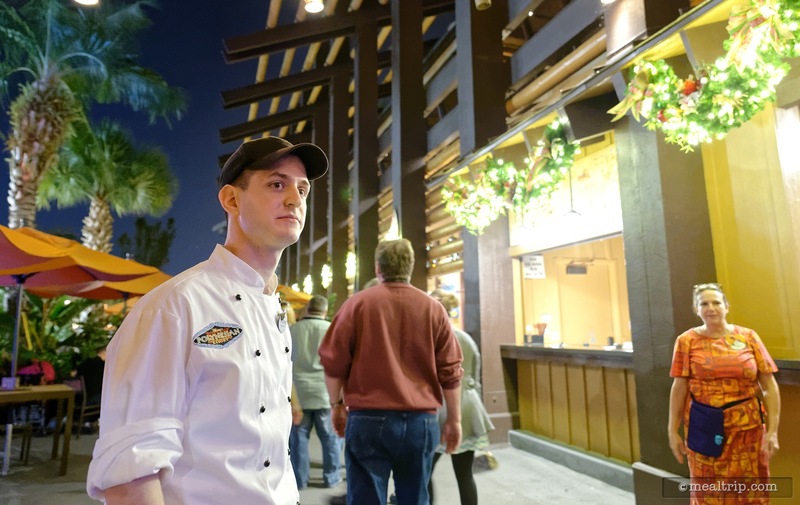 Look for event staff with a little blue sign that reads "Highway in the Sky". If you see this tiny sign, you're in the right place! 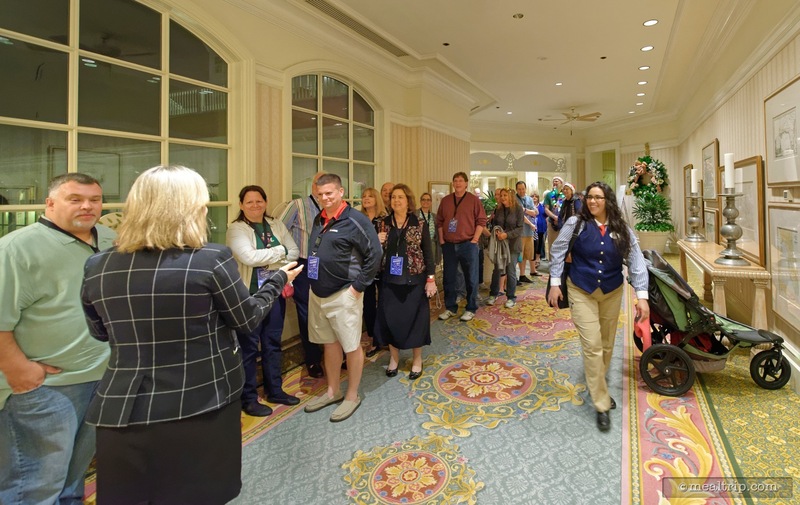 There will be event staff to the right of the Wave's check-in podium with a list of Highway in the Sky guests and your credentials for the event on a lanyard. 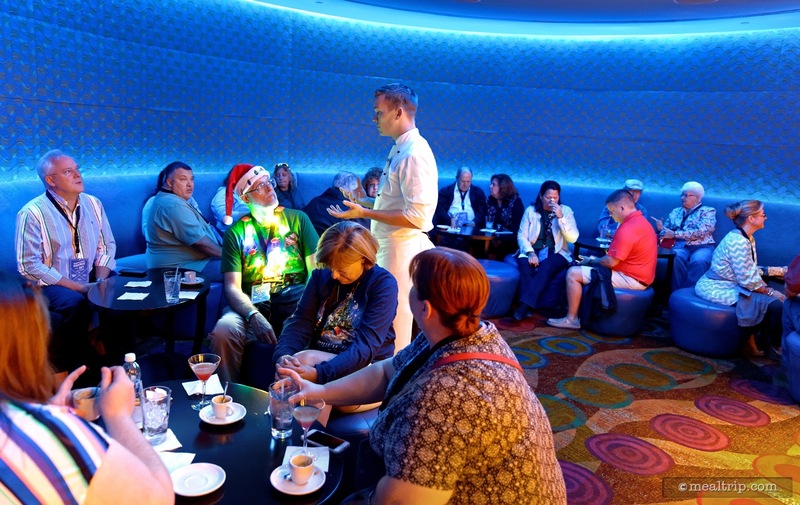 The event is limited to 25 guests, so one of the "lounge" rooms just off to the side of the Wave Lounge is reserved just for you! 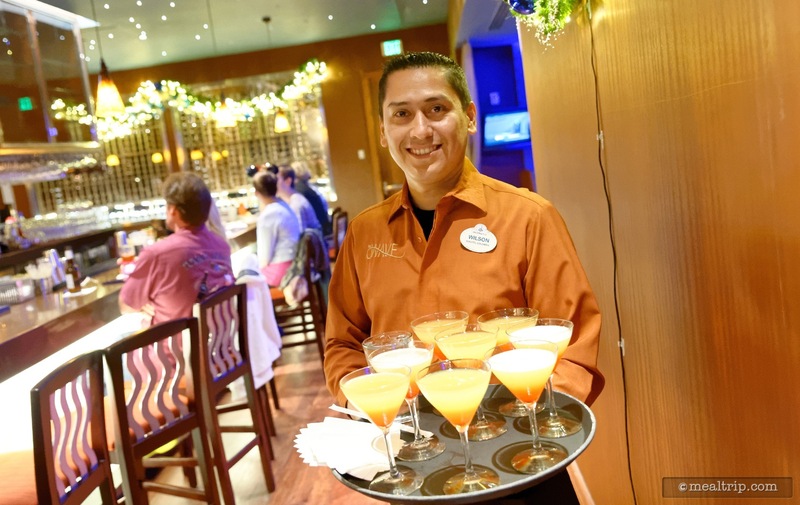 Wilson brings out a tray of Bay Lake Sunset cocktails. 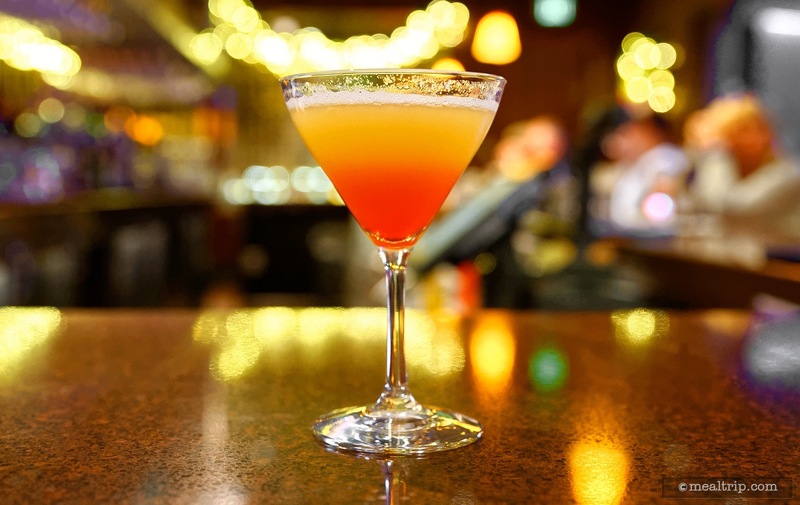 The featured beverage at the "first course stop" is a Bay Lake Sunset, which is generally only available to guests that have access to the exclusive Top of the World Lounge in the Bay Lake Tower complex. Chef Baker (no, that's not two titles, his name is Baker, but he's a Chef)... brings out the first course... Pan-seared Scallop, Butternut Squash Purée, Roasted Mushrooms, and Truffled Pecan Brown Butter. Here's a close-up of the very dense, rich, velvety soup-like creation. 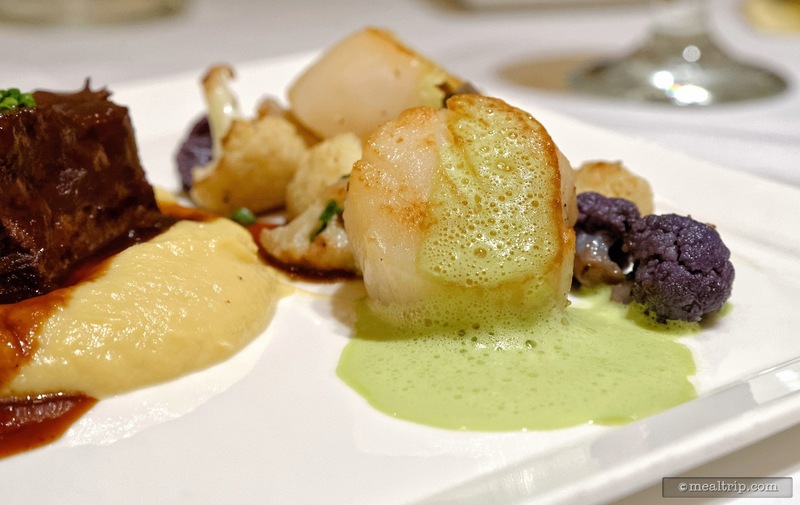 Pan-seared Scallop, Butternut Squash Purée, Roasted Mushrooms, with Truffled Pecan Brown Butter. 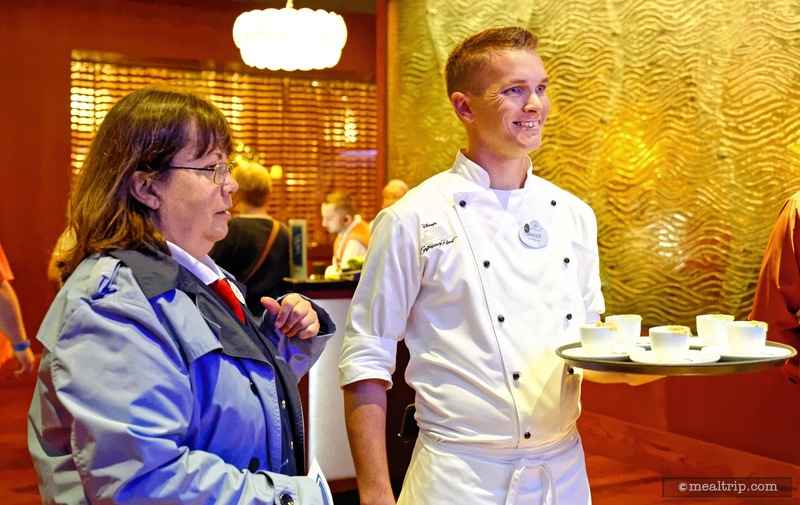 One of the cool aspects of the Highway in the Sky Dine Around experience is getting to talk one-on-one with the chef's at each stop. 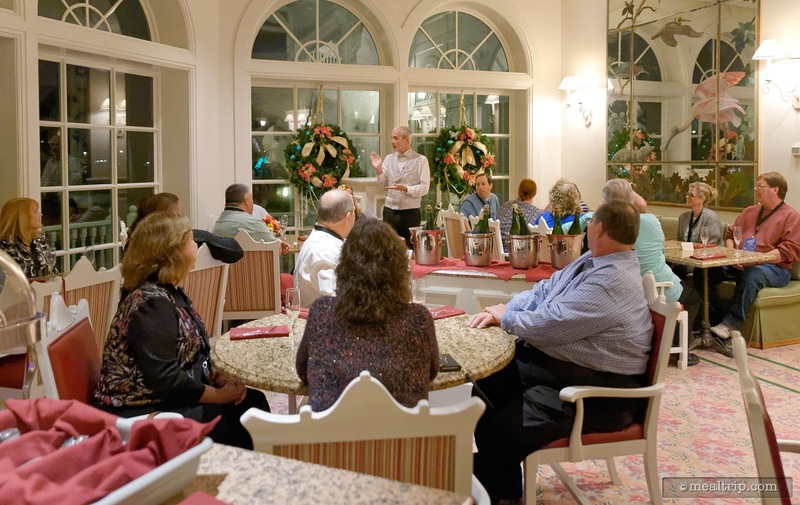 With only 25 guest per group, there's plenty of time to discuss the dish or the restaurant that the chef creates his (or her) dishes in. 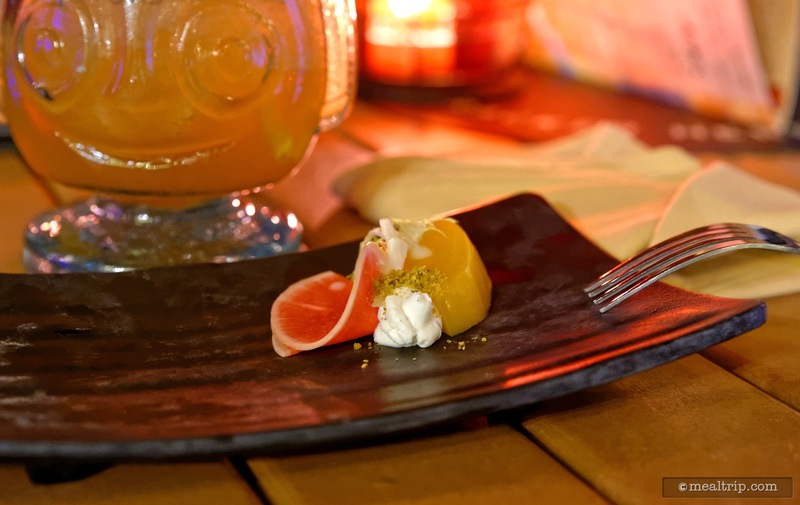 Chef Baker from "the Wave of American Flavors" created the first course dish at the Highway in the Sky Dine Around event. 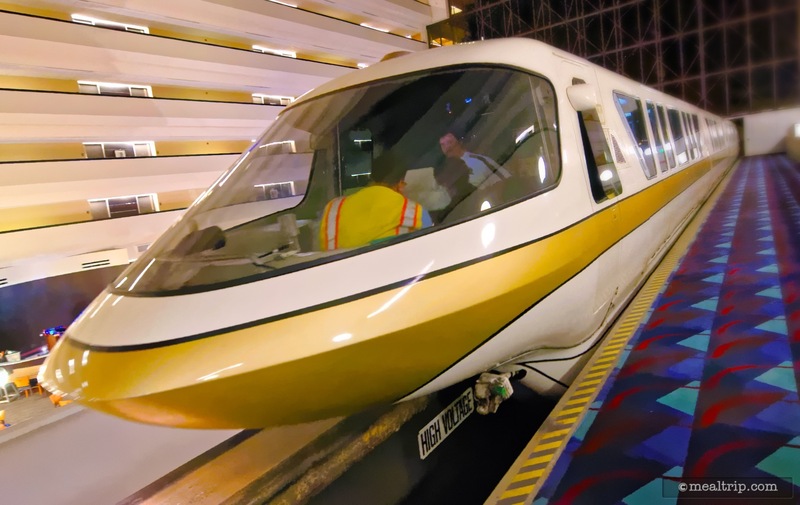 It's time to hop on the monorail! 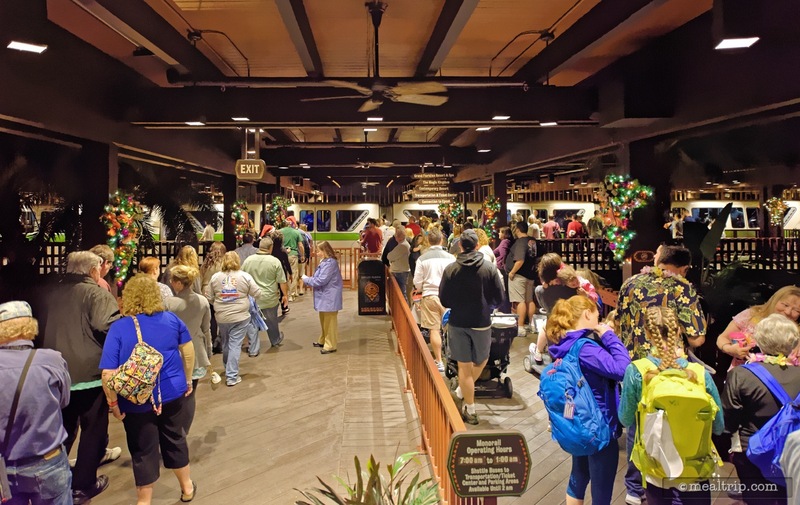 Guests leave the Wave and walk as a group to the monorail platform, which is a few floors higher than the Wave's location. 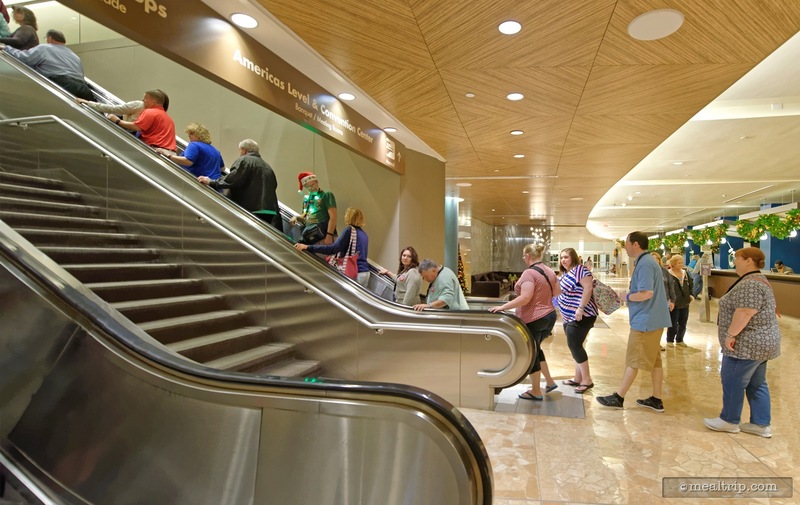 This is not a fast paced walk at all and full-on elevators are available. 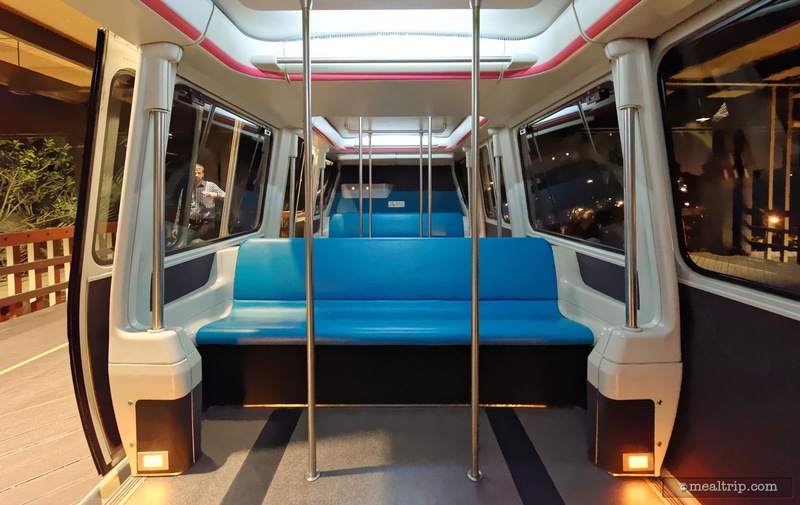 Ahhhhhh... our first look at a monorail! Unfortunately, this one was traveling in the wrong direction. 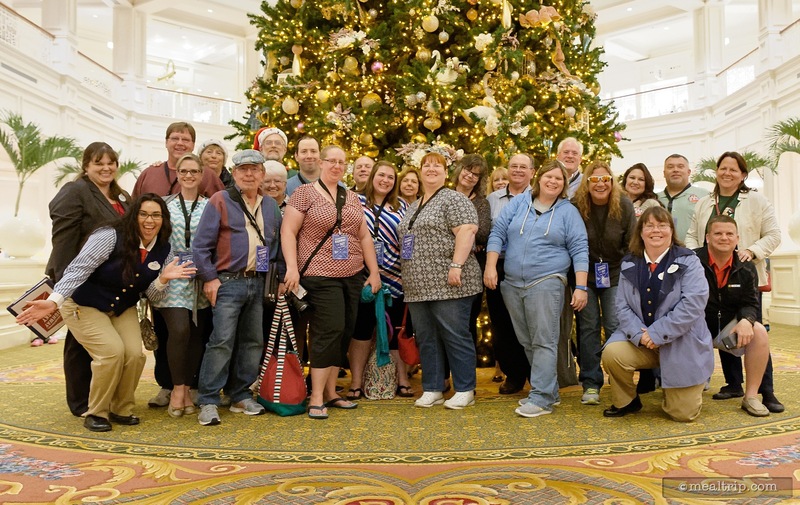 Our monorail arrived just moments later! 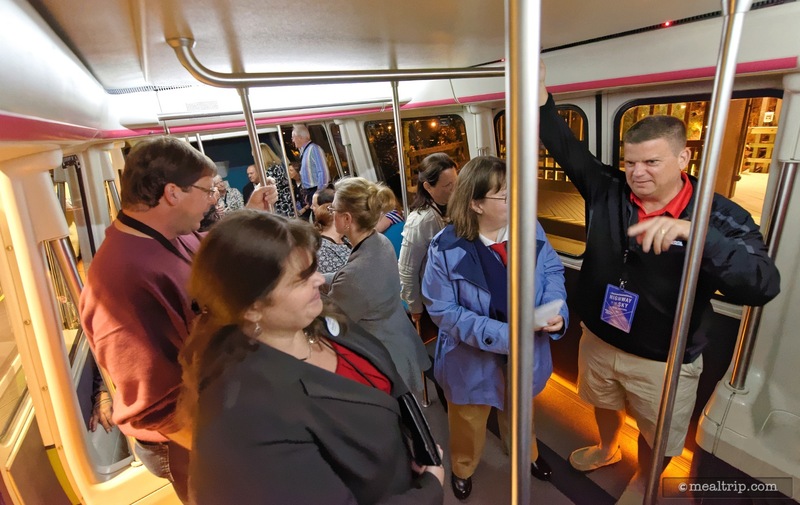 Each time our group of 25 guests got on a monorail, an entire compartment was being held in reserve. One compartment is actually two doors. 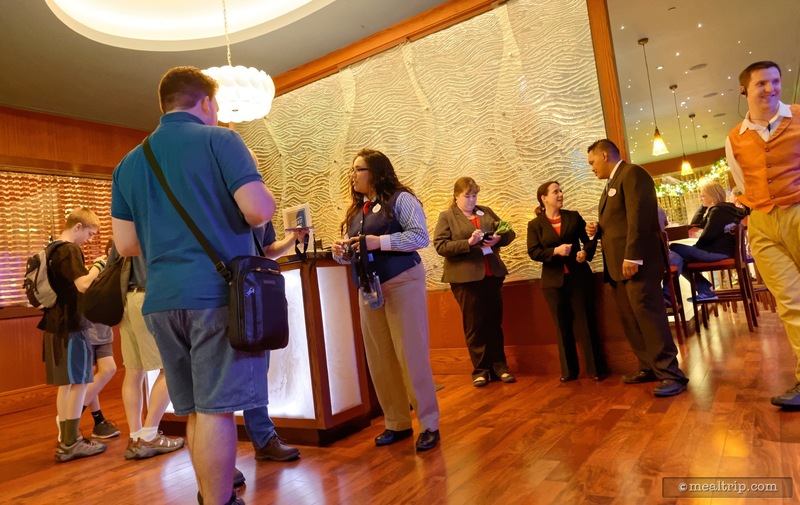 While it is large enough to hold 25 people, some guests will have to stand. Our Highway in the Sky Dine Around group (on the left) enters the Polynesian Resort from the monorail landing. 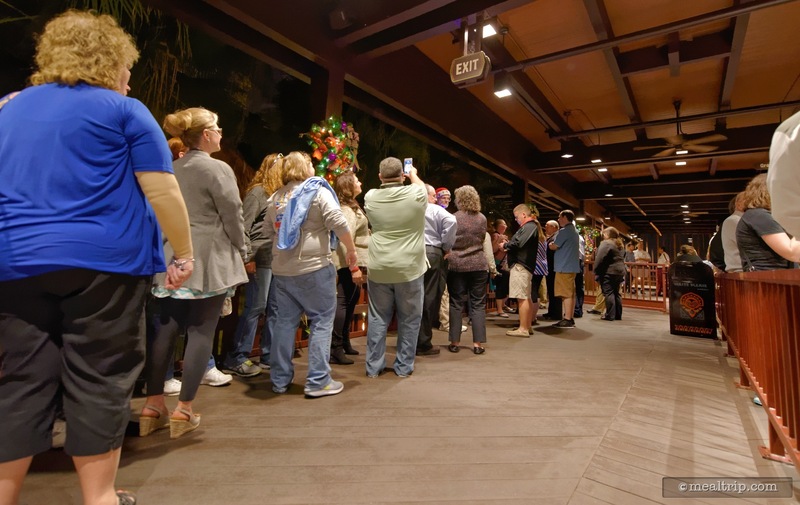 After making our way through the Polynesian and out the back door, we are all lined up and ready to enter the Trader Sam's Patio area. 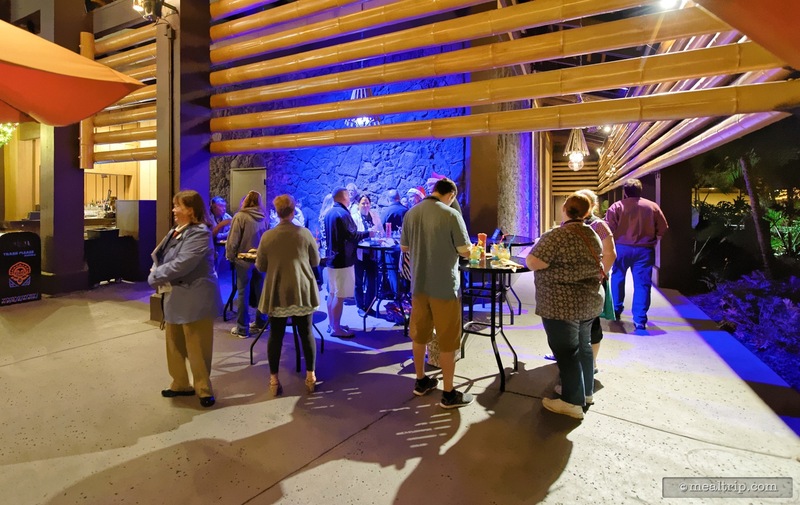 A special area along side the building is set aside for Highway in the Sky guests. 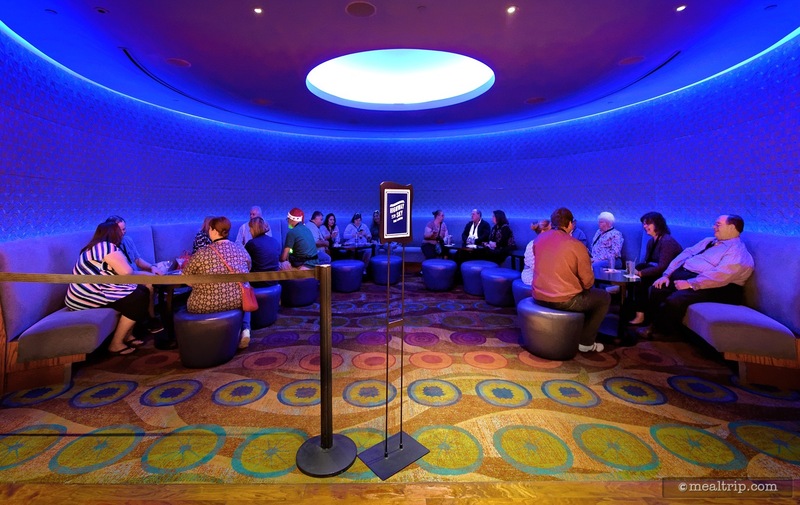 Some seating is available for guests that can not stand for long periods. 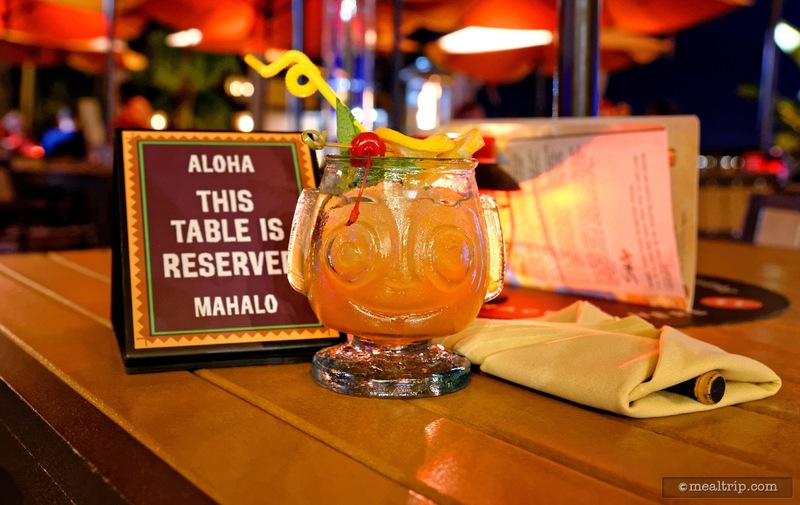 The cocktail served on the Trader Sam's stop of our tour is the popular Hippopotomaitai (no, you don't get to keep the glass). 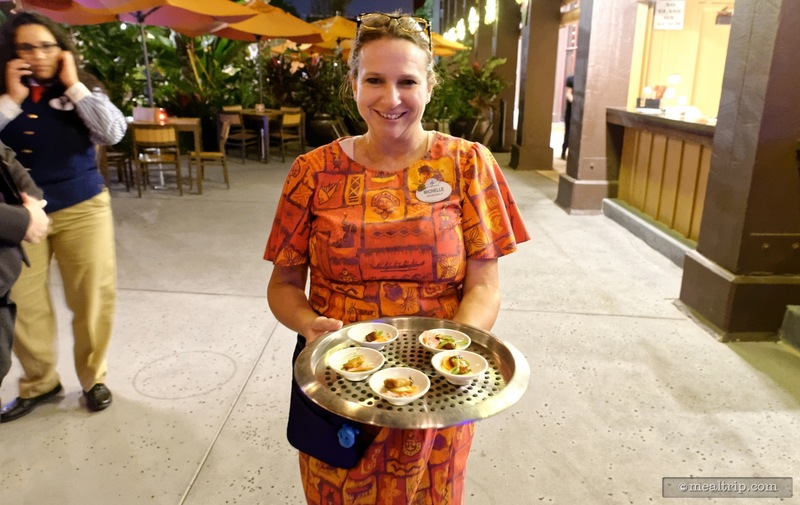 Our Trader Sam's representative Kelsey soon appeared with the first plate of two food items that we would be sampling that evening. 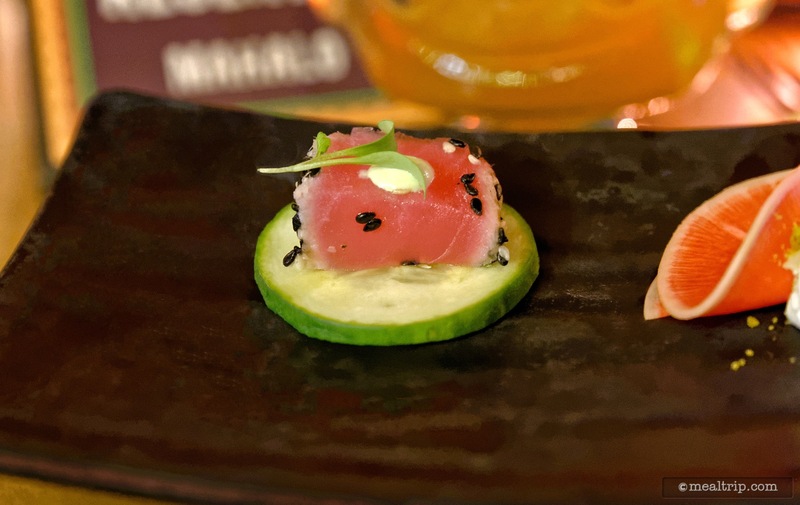 This Sesame Crusted Seared Tuna on Cucumber with Crème Fraiche, Micro Cilantro was one of three items sampled at Trader Sam's. The Roasted Beef Salad includes Golden Beets, Herb Goat Cheese, Pistachio Dust, Simple Vinaigrette, Frisée Lettuce, and Pickled Watermelon Radish. The morsel was delicious... but I'm still struggling with the word "salad" being used here. Here's a pull-away shot of the Roasted Beet Salad, which is about the same size as the fork to the right. 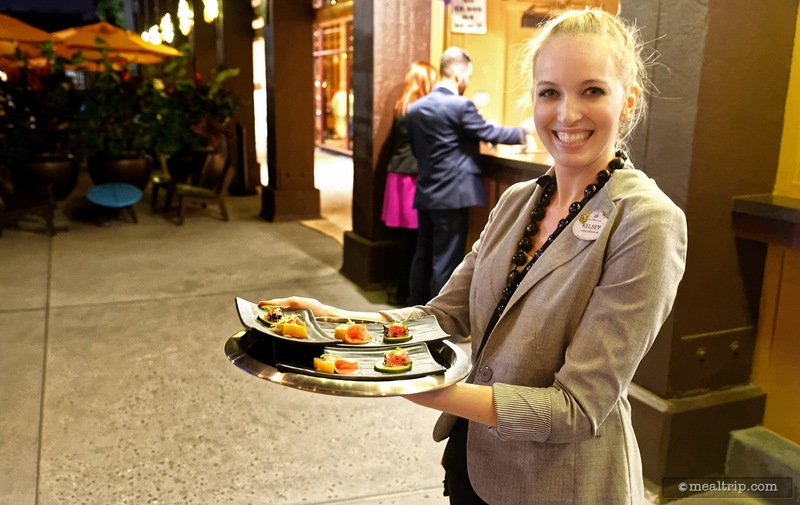 The evening is very well paced and there is enough time between courses at Trader Sam's to mingle with other guests and take a few photos of the delicious culinary creations. Before long, the third morsel was served... a Citrus Chile Dusted Pork Belly. 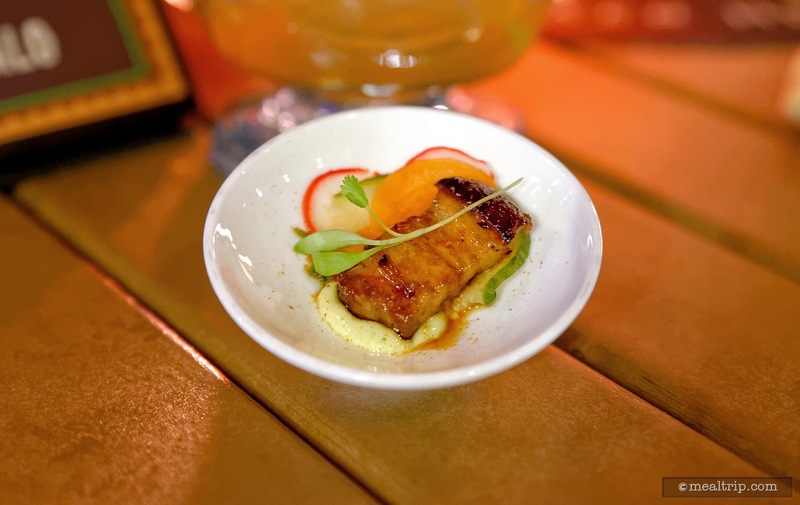 Here's a close-up of the Citrus Chile Dusted Pork Belly with Garlic-Lime Mayo and Pickled Vegetables served at the Trader Sam's portion of the Highway in the Sky Dine Around event. 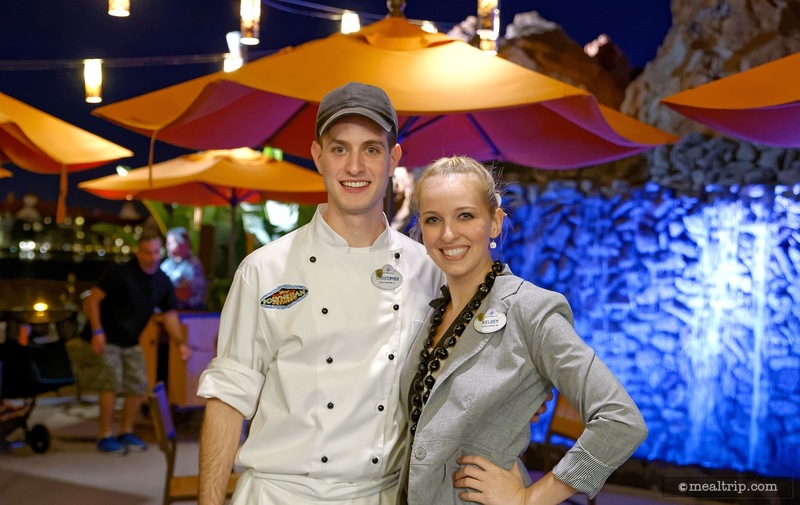 Chef Christopher and Trader Sam's Representative Kelsey were available for discussing the food items, cocktails, or general questions about Trader Sam's. 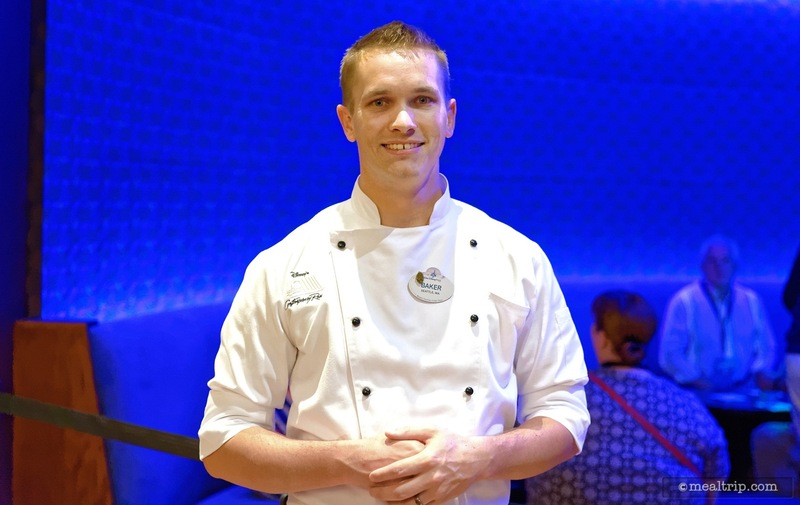 Chef Christopher bid farewell to each and every guest as the Highway in the Sky group left for the monorail platform. 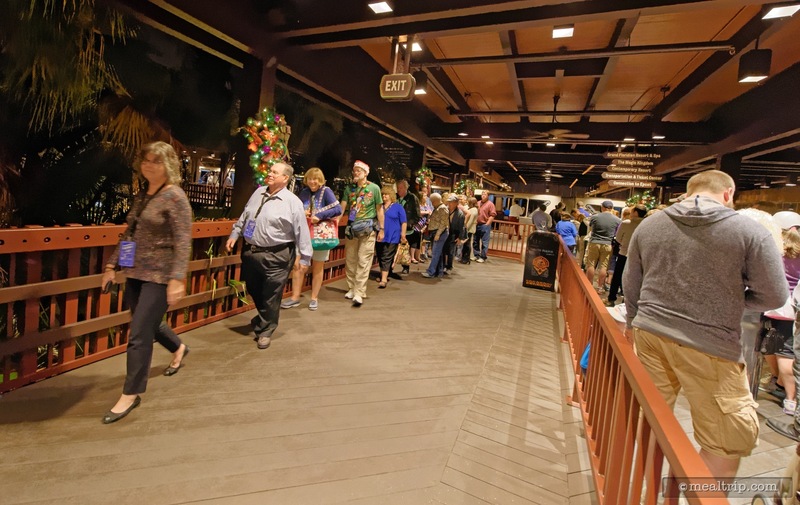 The Polynesian was quite crowded as we made our way back to the monorail. 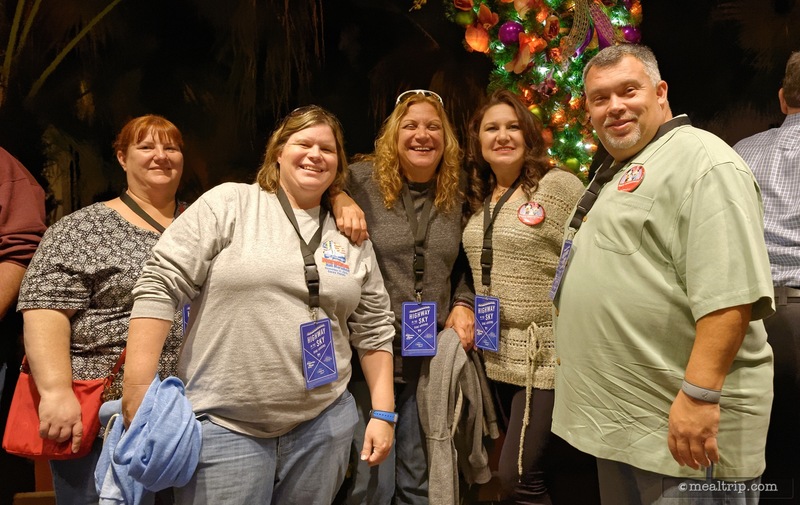 Because our group was lining up in the "exit" cue of the monorail platform (via special permission of course), nobody got lost in the crowd or separated from the group. 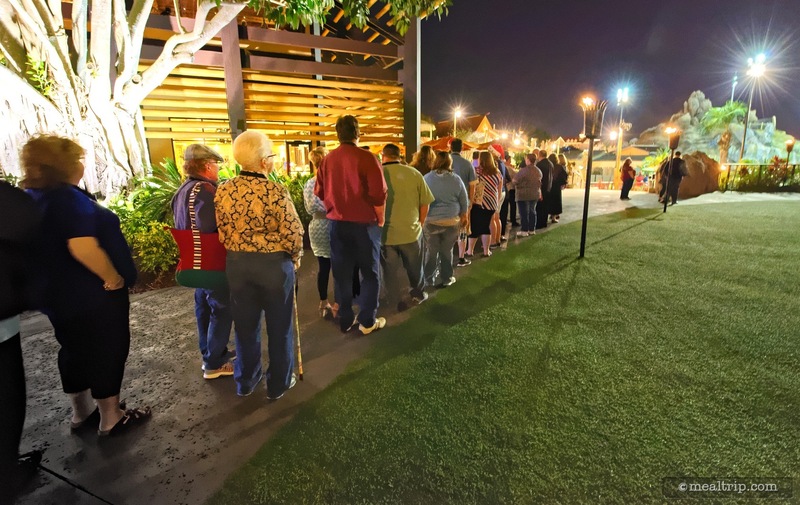 There was a slight timing delay at the Polynesian as it was roughly ten minutes before anyone saw a monorail. It was here that I learned, there are in fact, boats available to take us all to the next destination... just in case. The extra time gave us an opportunity to take photos of some of the new friends we were meeting! 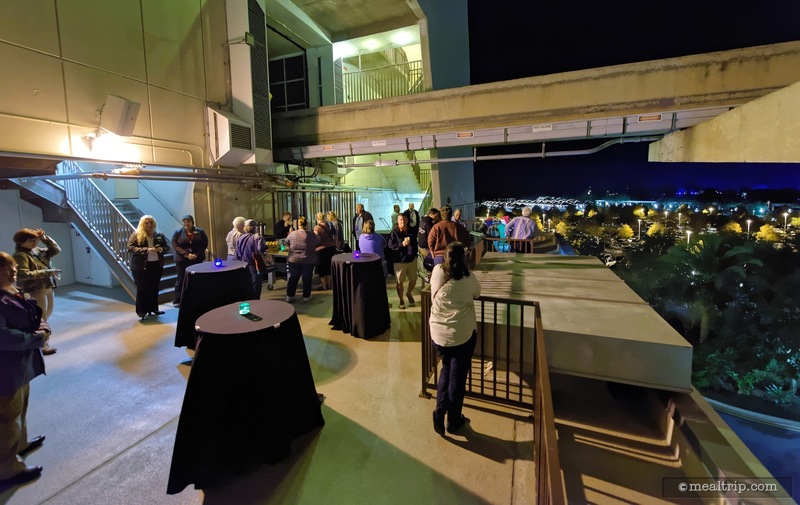 It is of historical importance, that we all were the first group of 25... ever... at the very first Highway in the Sky Dine Around! 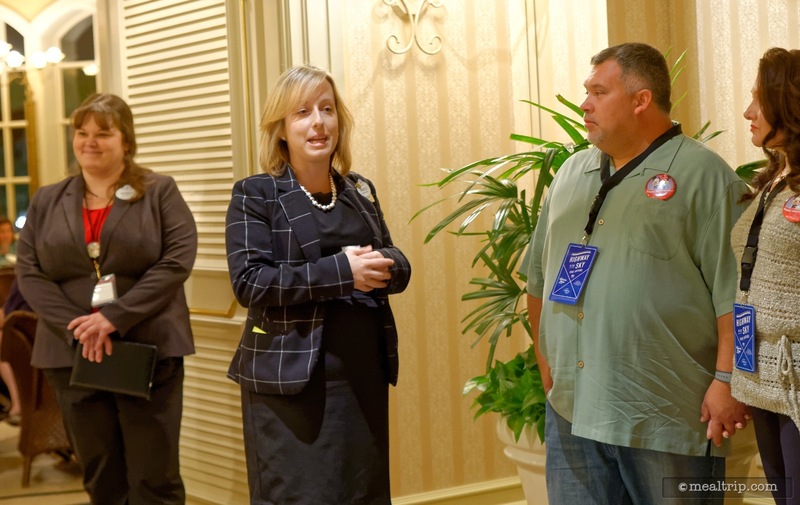 The monorail has arrived! The Highway in the Sky group has been cued up on the left side of this photo, while the "everyday" guests are on the right. As always, we had an entire monorail compartment reserved just for our group of 25. 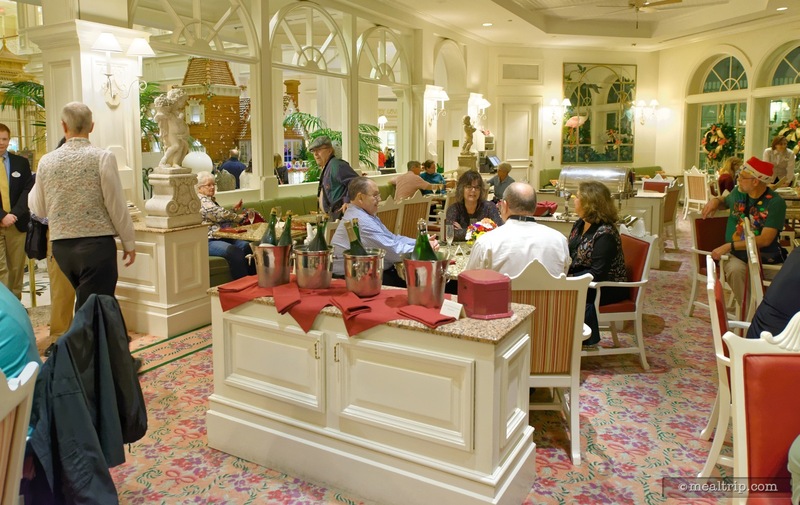 The next stop was at the Grand Floridian's Citricos. 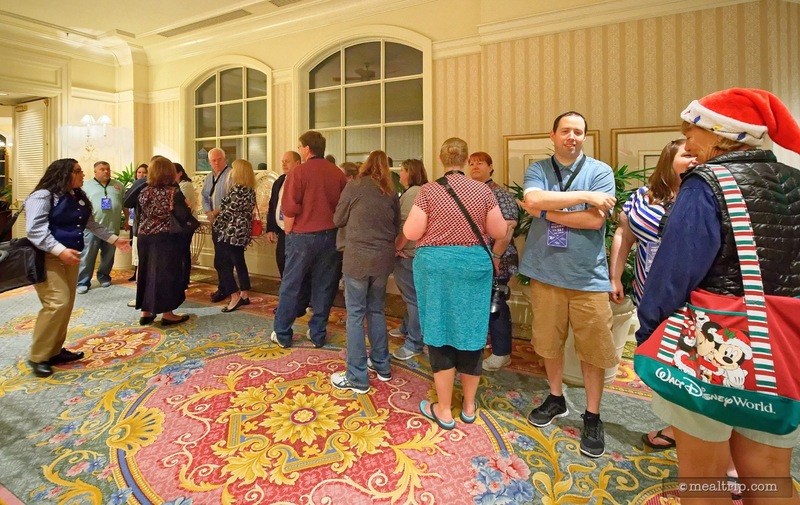 We're all lined up in the hall awaiting the arrival of the Citricos representative to begin seating us. 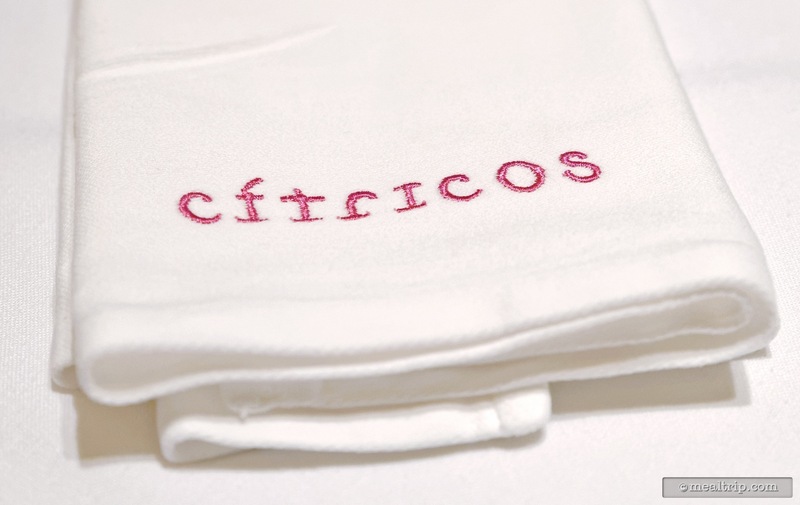 Citricos is a busy restaurant that is often booked solid. 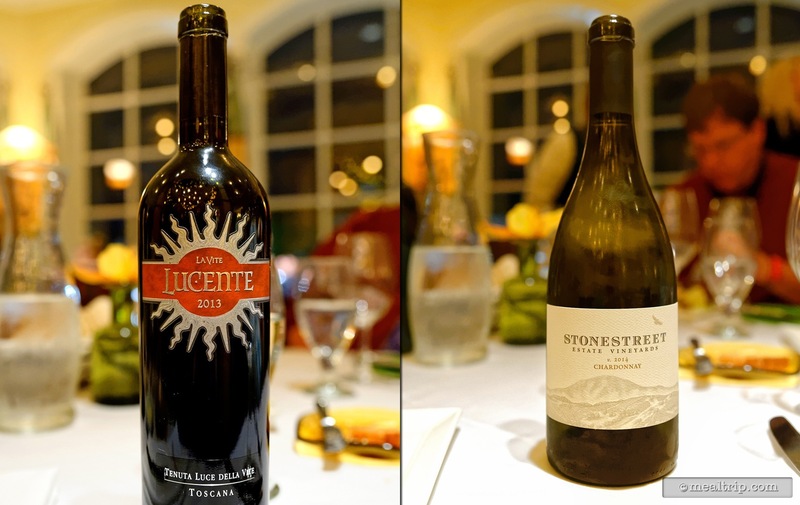 Because of this, we obviously couldn't all sit together at a table for 25. 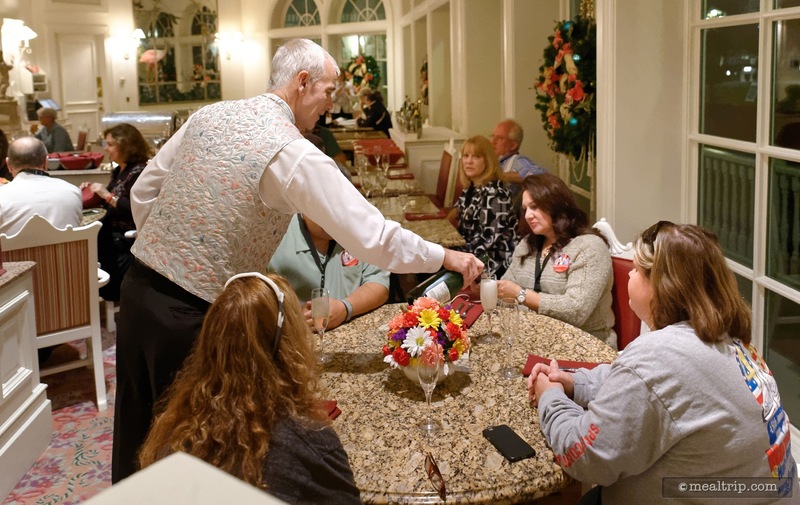 Everyone was carefully counted smaller groupings were brought into the restaurant. Our Citricos representative for the evening was Danielle. The main centerpiece table was in fact, reserved for at least eight members of our group. The other tables of six were nearby. 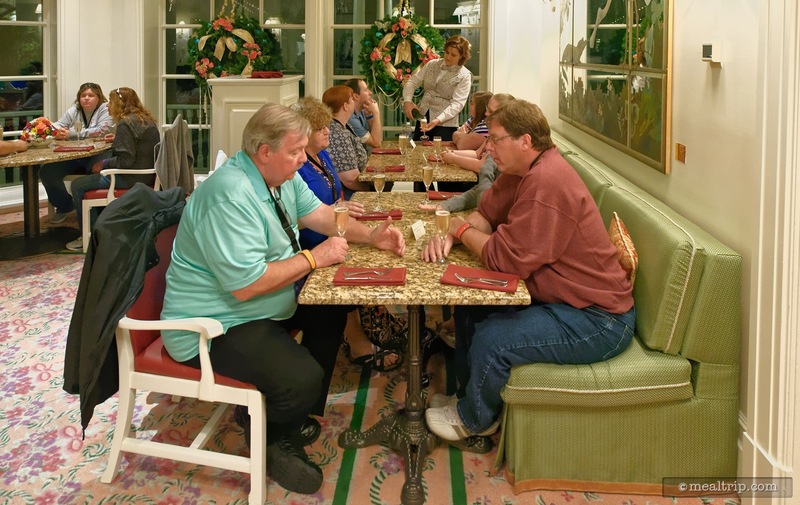 I like the way this inner area of Citricos is designed quite a bit, so for me, there really was no "bad" seat. Well sure, they have their name stitched in the napkins. 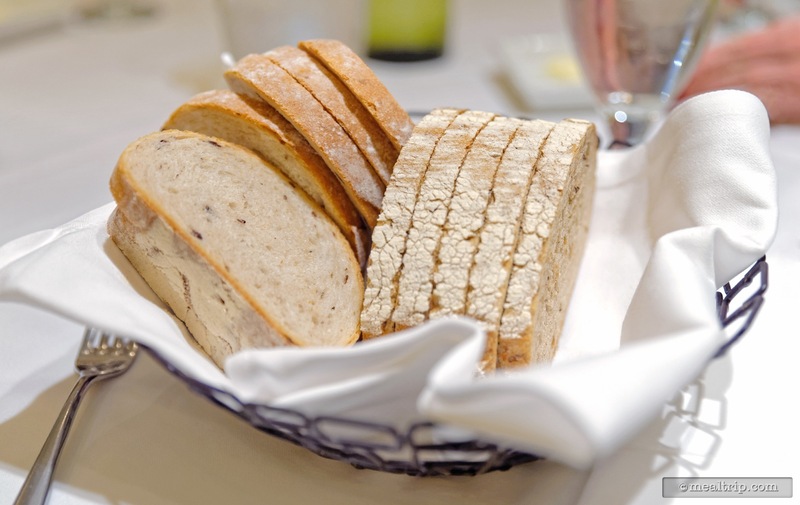 There were two kinds of bread available, a Multigrain Bread and the Citricos Olive Loaf. Butter with large grain sea salt was also on the table. 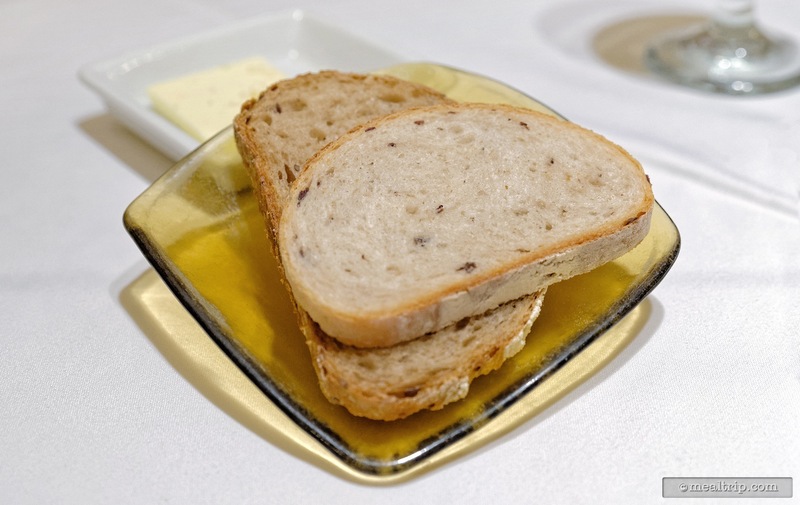 Here's a shot of my bread, with that butter and sea salt far off in the distance. 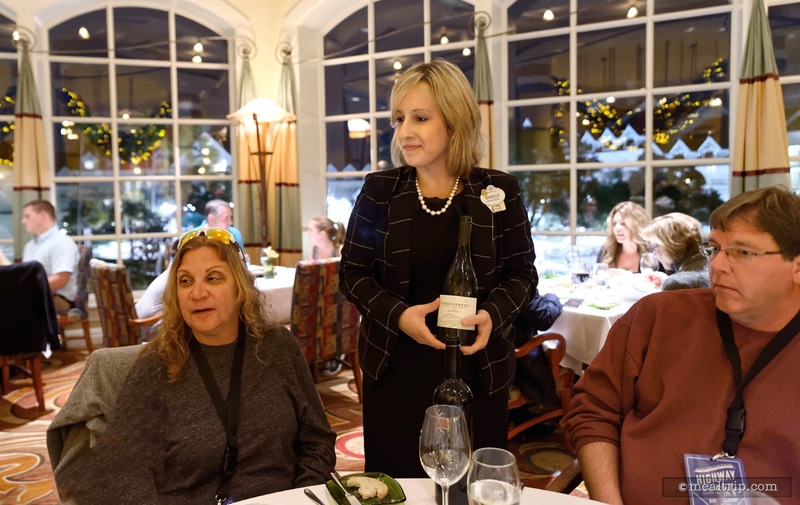 Danielle gave a little background on the wines, but when there's only two wines available and not much choice on what's coming out of the kitchen... there's no incentive to select one over the other. Just have a small sample of both. 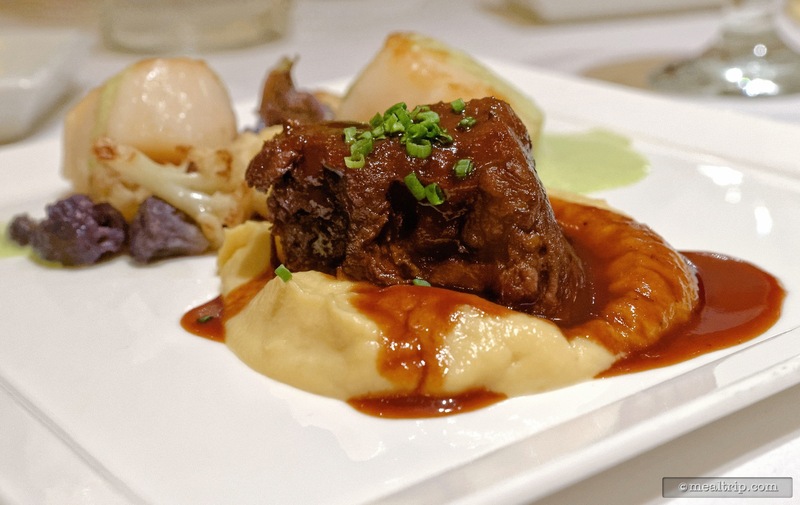 The Citricos portion of the event was "on the books" as being Braised Short Ribs and Fish. That is a rather simple description for everything that was happening on this plate. The "fish" in this case, had been substituted with a couple perfectly seared scallops. 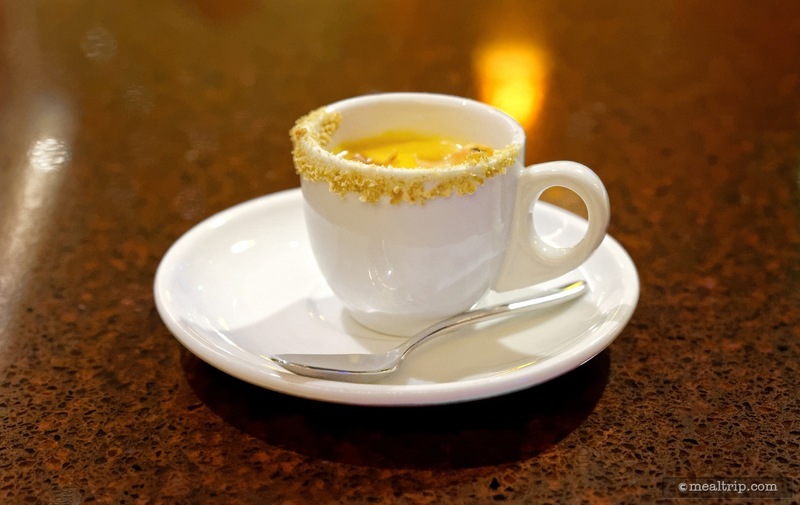 (Which is more about making sure the best ingredients of the day are being used for all 25 guests). 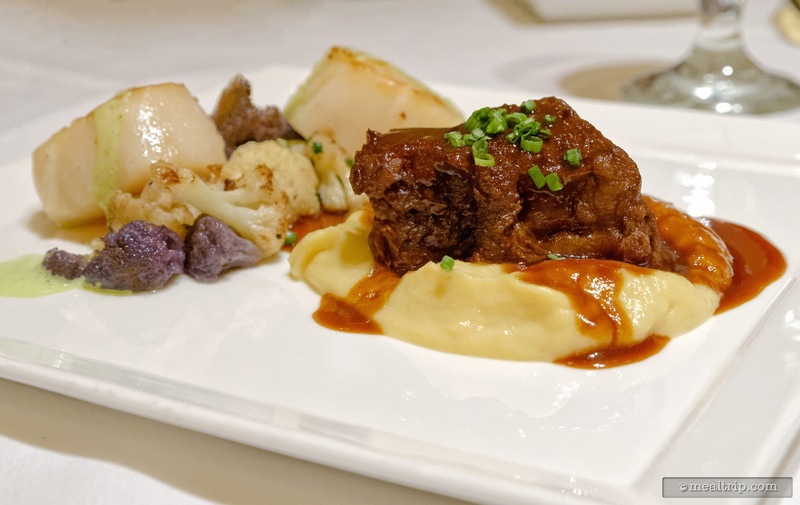 Here's a closer look at the Braised Short Ribs served on Polenta. 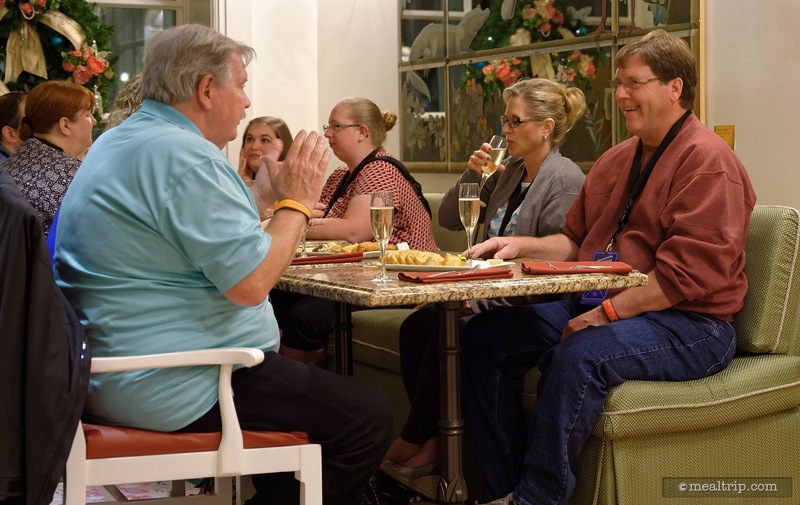 After the Citricos portion of the Highway in the Sky event, guests were escorted to the nearby Garden View Lounge (also in the Grand Floridian). 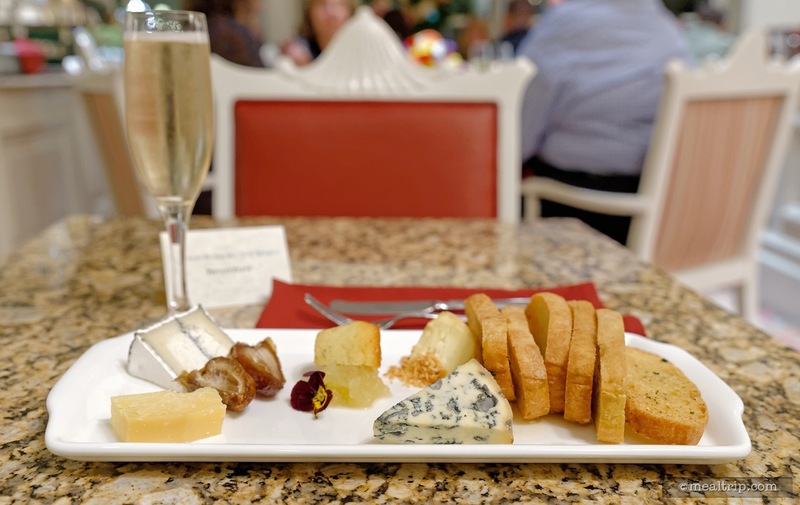 Our representative at the Garden View Lounge, Jefferey, talked about the "fourth" course in our culinary adventure... a cheese board and sparkling wine. 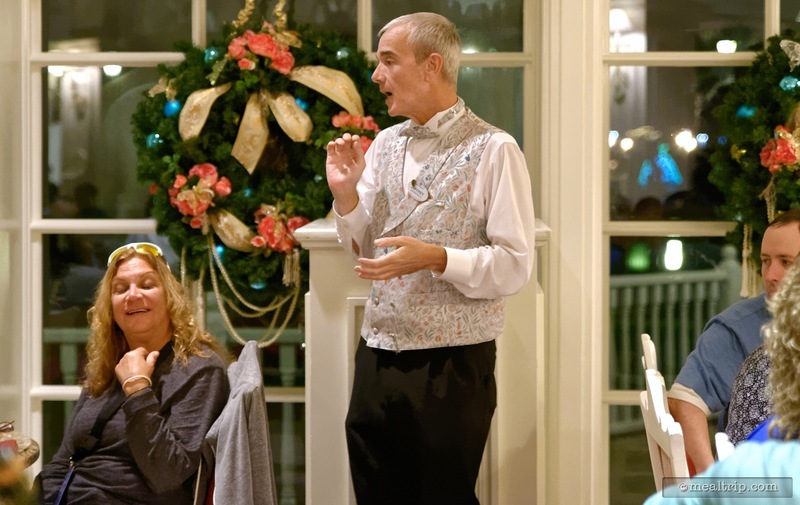 Jefferey describes each of the cheeses and their pairings on the cheese board (and that the board is plated for two people to share). What a cute place card. 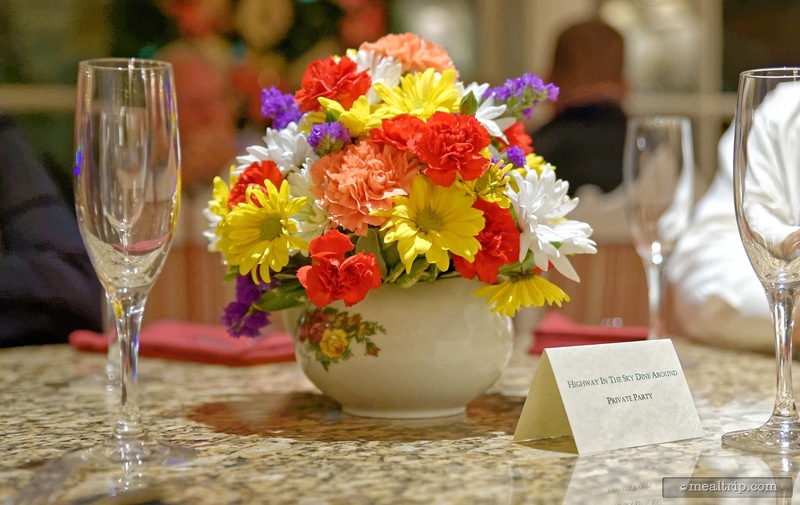 These cards along with fresh flowers were placed on about one third of the tables in the Garden View Lounge. This is one of the fresh cut flower arrangements on most of the tables at the Garden View Lounge. 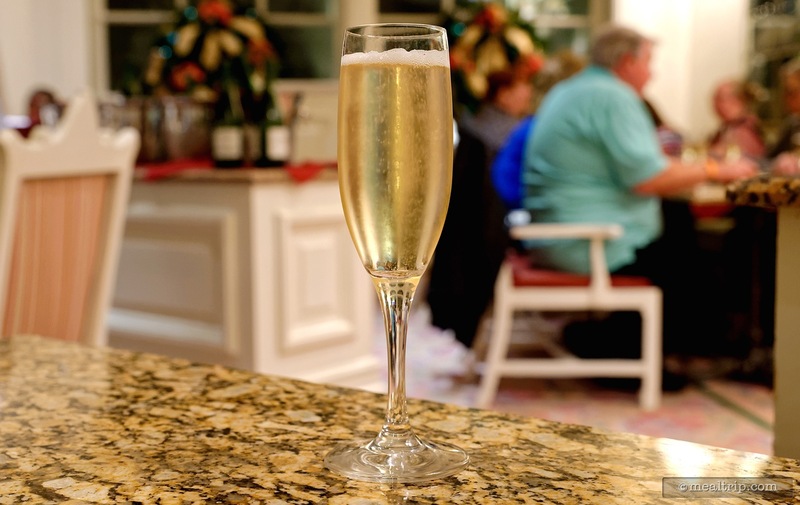 The Fairy Tale Celebration Cuvee is being kept chilled and was served at the perfect temperature. 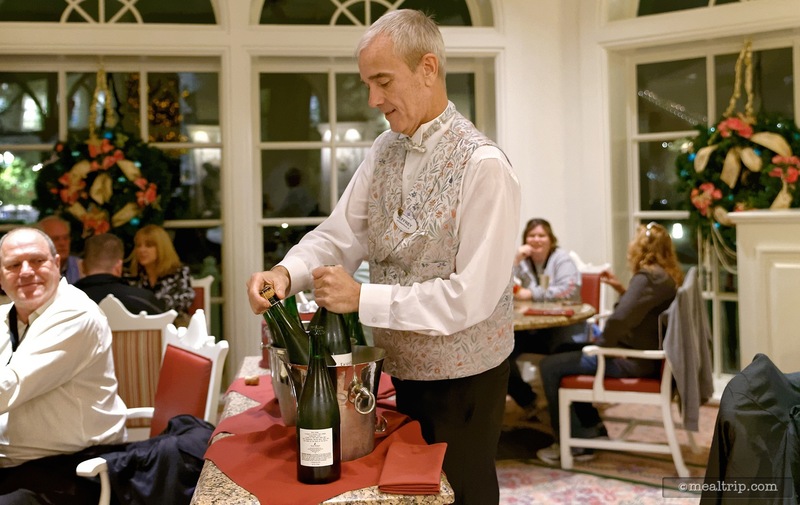 Each guest gets a full flute of the sparkling wine from Sonoma County. 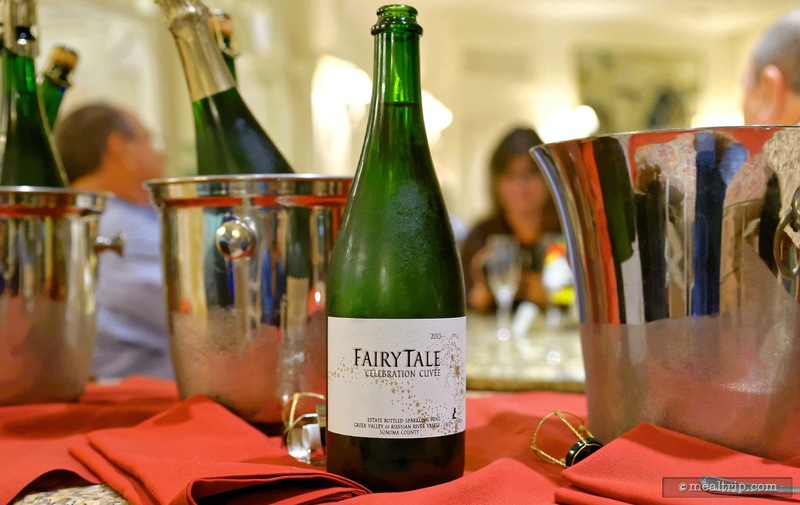 A close-up of the fourth course sparkling wine, a 2013 Fairy Tale Celebration Cuvee. And here's a flute of the Iron Horse Fairy Tale Cuvee. 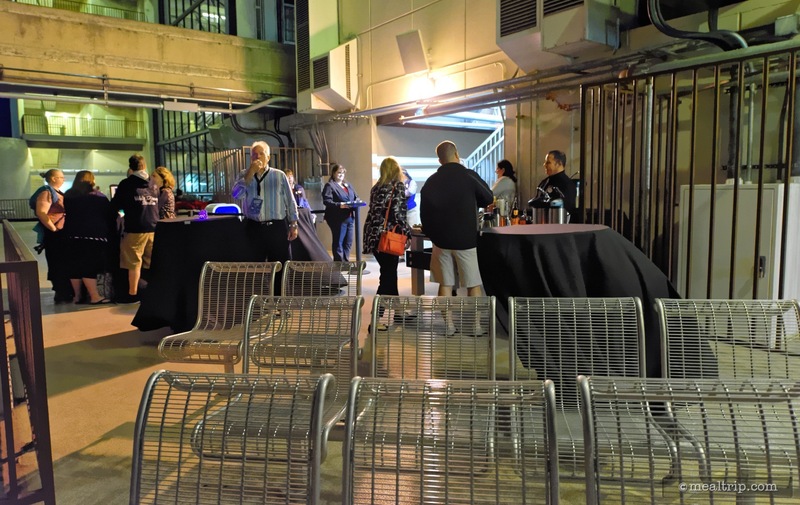 The various seating (and standing) formats at each location allows all of the guests to visit with one another over the course of the evening. 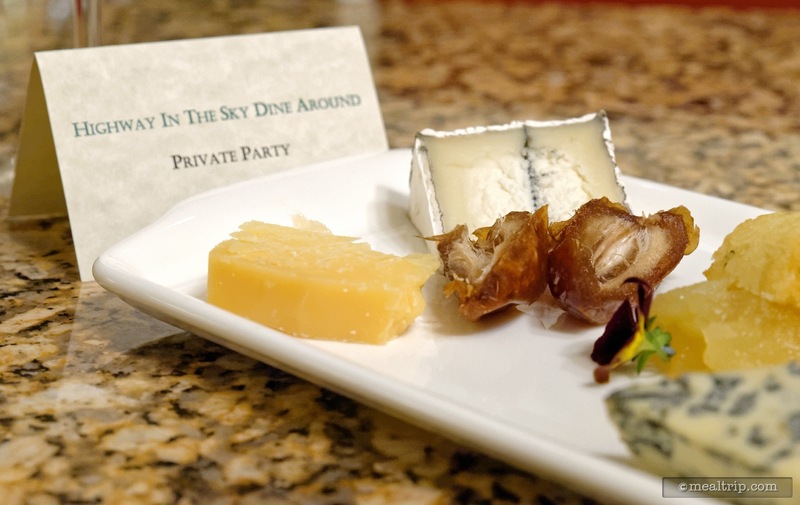 Each of the cheese boards has been plated to serve two guests. 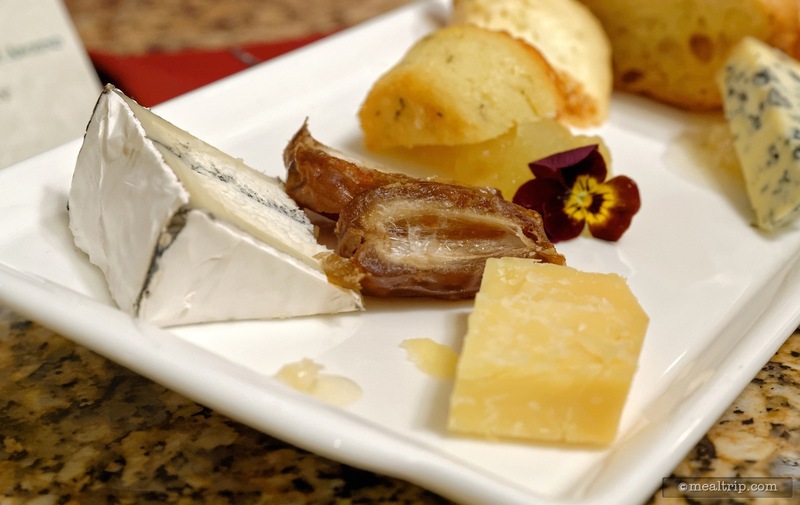 The two-person cheese plate is very (very) similar to the Citricos cheese board. 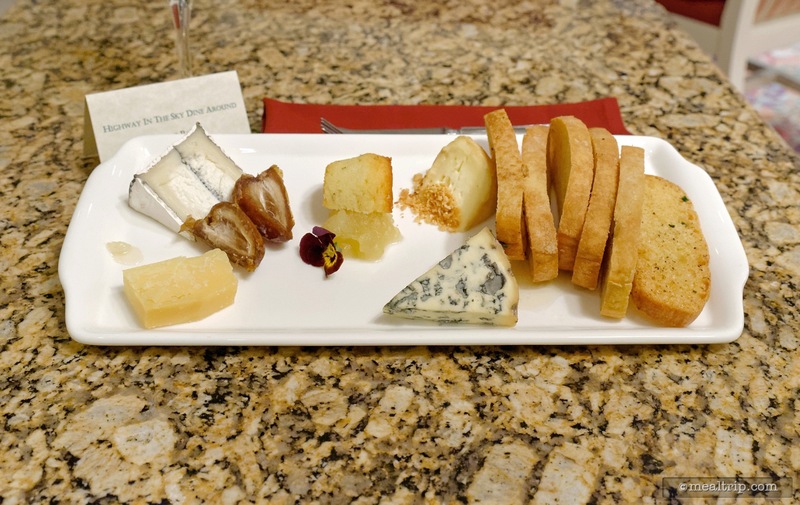 The "fourth course" cheese board contained a Red Hawk Triple Cream Brie, Humbolt Fog Goat Cheese, the (very good) Cabot Clothbound Cheddar Cheese, and a Fourme D'ambert Blue Cheese, all with accompaniments, an edible flower, and half of a House-made Lemon-Thyme Cupcake. 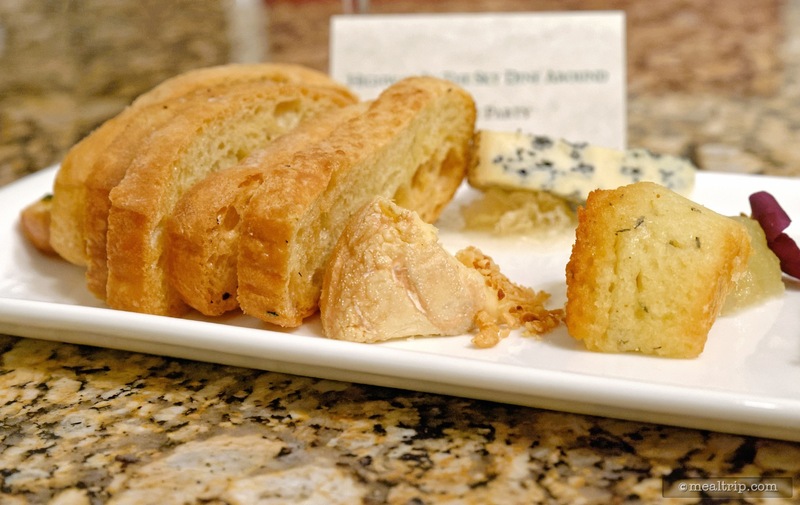 On the far left we had the Humbolt Fog Goat Cheese and in the center and more forward, the Cabot Clothbound Cheddar Cheese. The Red Hawk Triple Cream Brie was paired with Almond Praline. 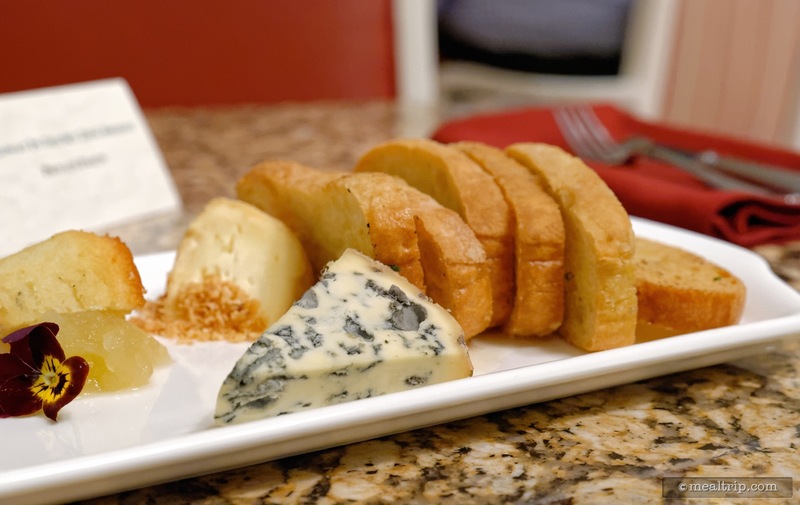 In the front of the plate is the unmistakable Fourme D'ambert Blue Cheese from Ambert, France. Mmmmmm... the Crostini (little toasted bread slices) were a great addition to the plate. 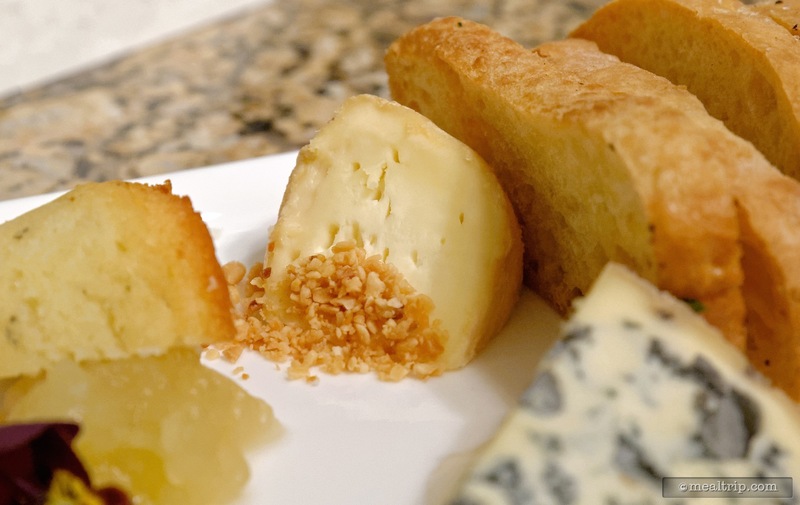 One more look at that Cabot Clothbound Cheddar Cheese from Jasper Hills, Greensboro, Vermont (on the left) and the Humbolt Fog Goat Cheese to the back and right. 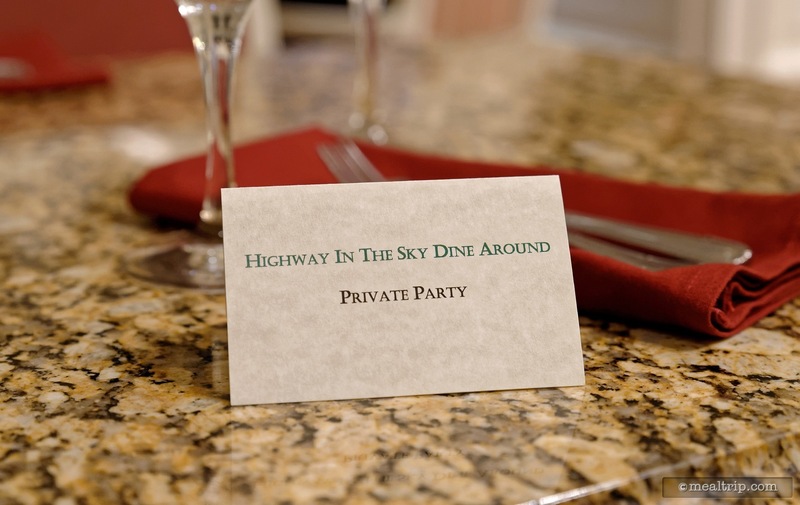 The first ever Highway in the Sky Dine Around group! 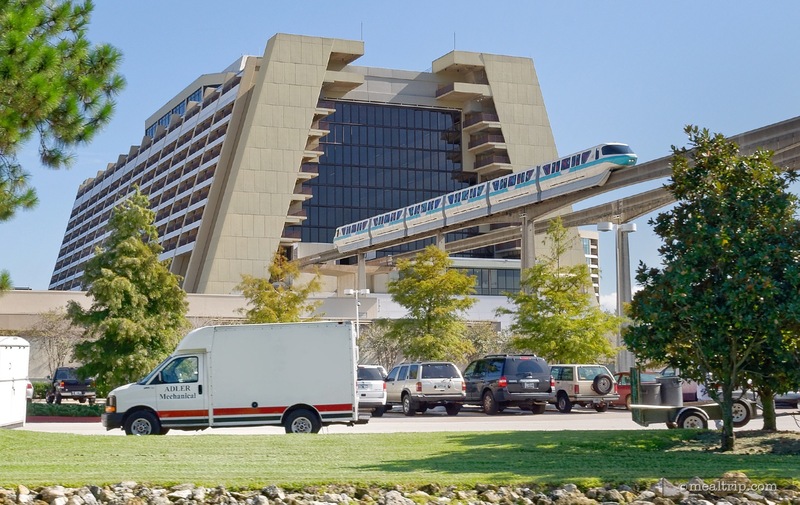 The final leg of the Highway in the Sky adventure returns to the Contemporary, but this time you get about as close to the monorail beam as you are ever going to get. This is the fourth floor landing area just outside the north side of the main building. 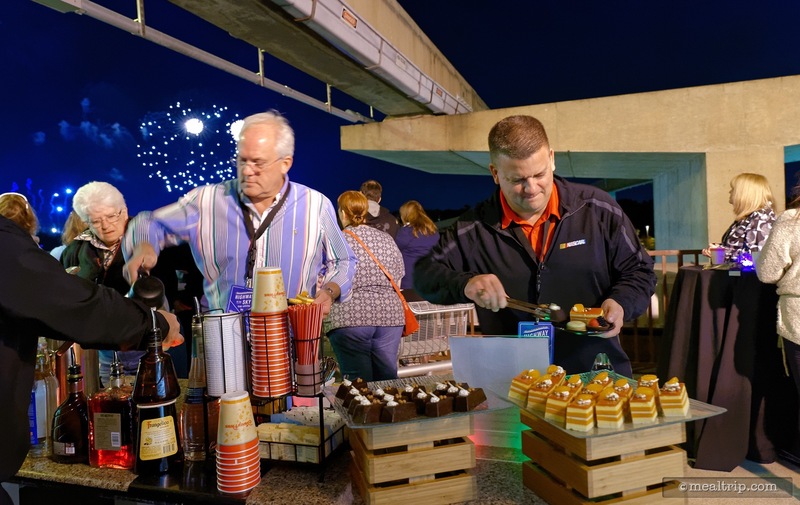 The Contemporary's Fourth Floor Deck is the setting for the fifth and final course which includes dessert, coffee, and cordials... all while you watch the Wishes fireworks over the Magic Kingdom. 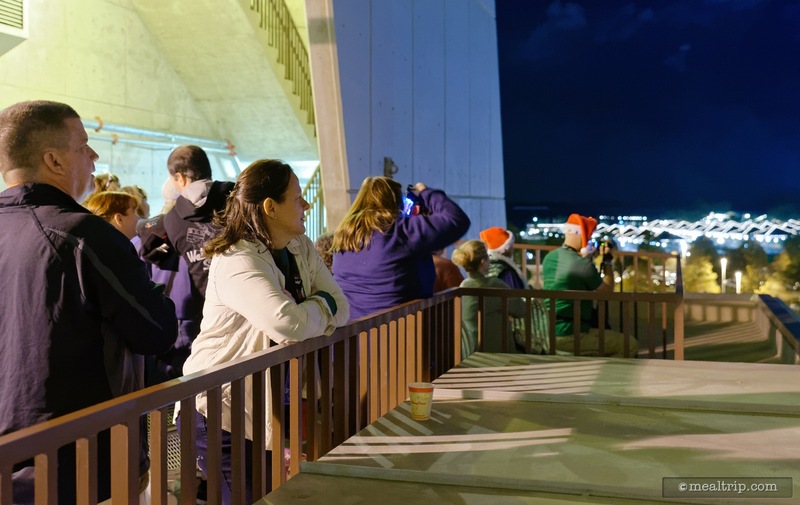 There are some perfectly positioned seats (that are bolted to the ground) for watching the fireworks. 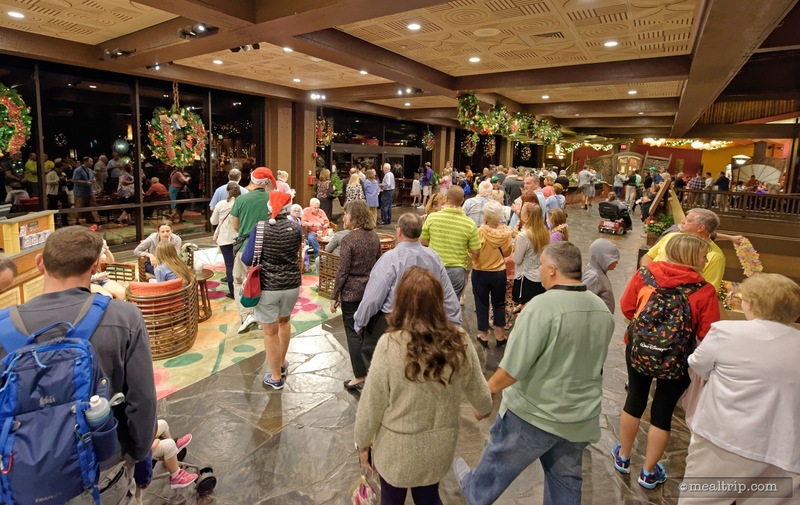 While there's not enough for all 25 guests, the remaining standing areas are not bad for watching Wishes and the area never feels crowded. 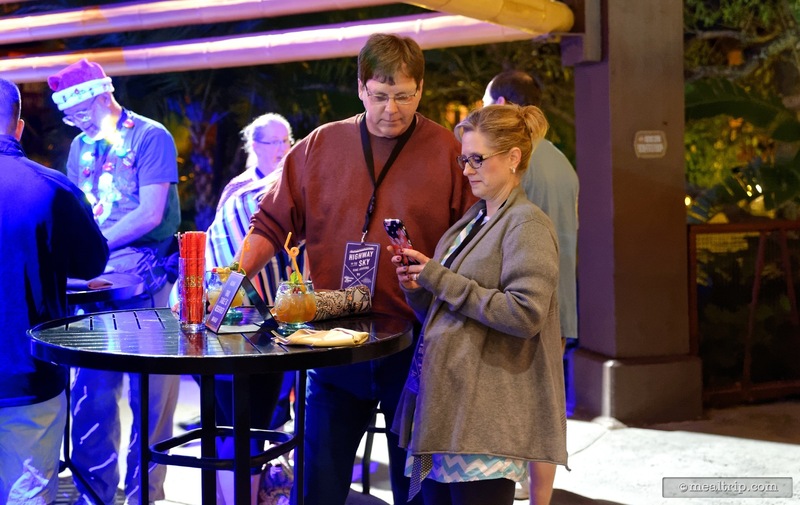 The dessert and beverage station is small, but the emphasis here is still on quality. 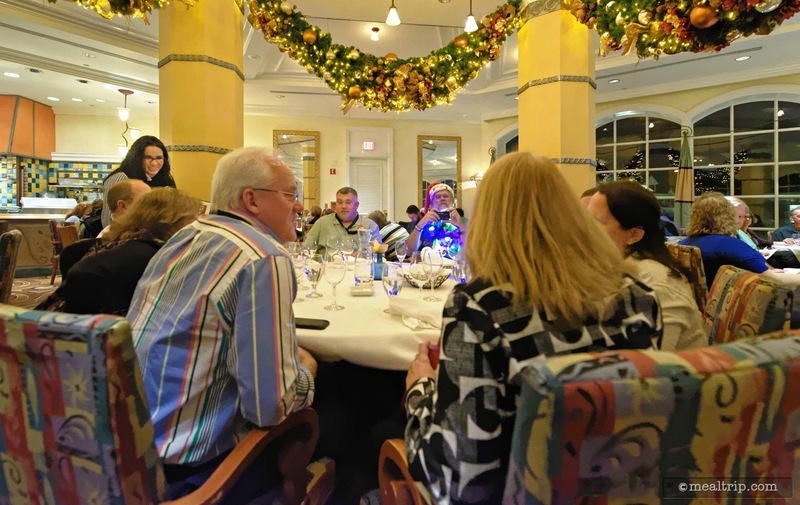 With only 25 people in the group, there was never time where you couldn't just walk up to the table. These are the Blood Orange Cake slices. 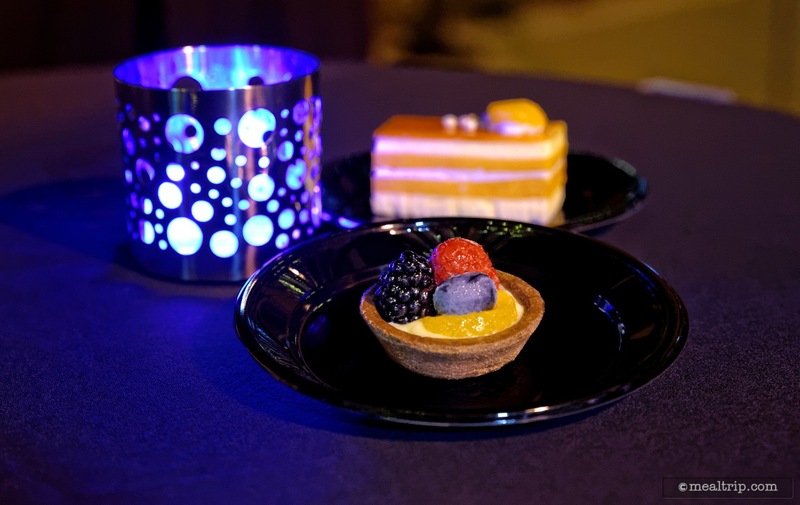 Another one of the four dessert offerings at the Highway in the Sky event are these little Heirloom Seasonal Fruit Tarts. 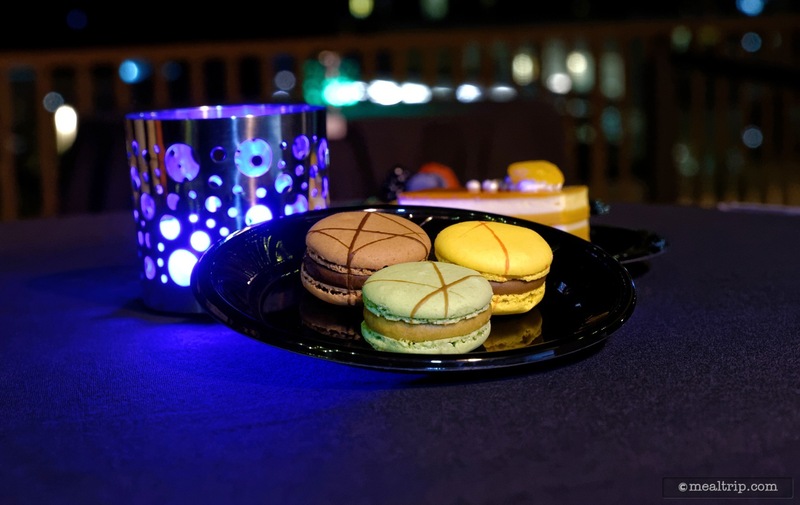 Each of the different colored Macaroons had a slightly different flavor profile. 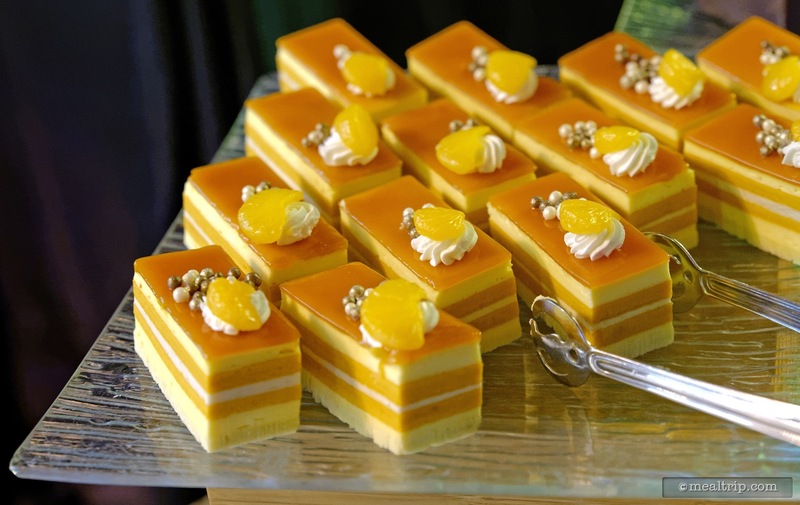 These, like all of the desserts, were the real deal. There wasn't one plain-old cupcake here. 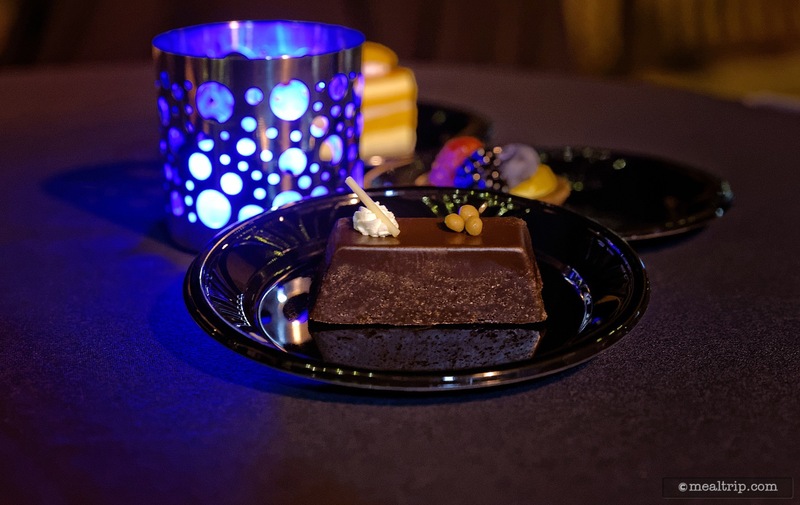 The Organic Chocolate Flourless Cake was incredibly dense and rich (which isn't surprising because... it was flourless after all). 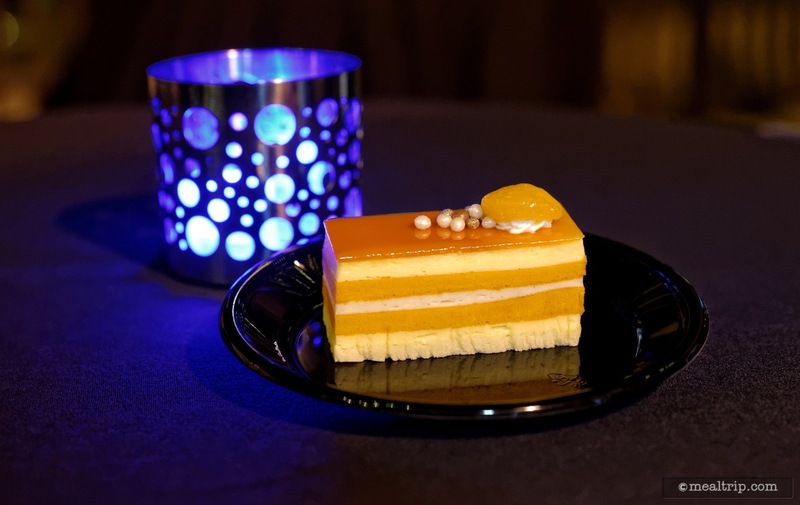 Here's another look at that yummy Blood Orange Cake that had multiple layers of cake, a dense cream, and a blood orange jam-like filling. It's almost time for the Wishes Fireworks to begin! As you can see, there's plenty of room for everyone. 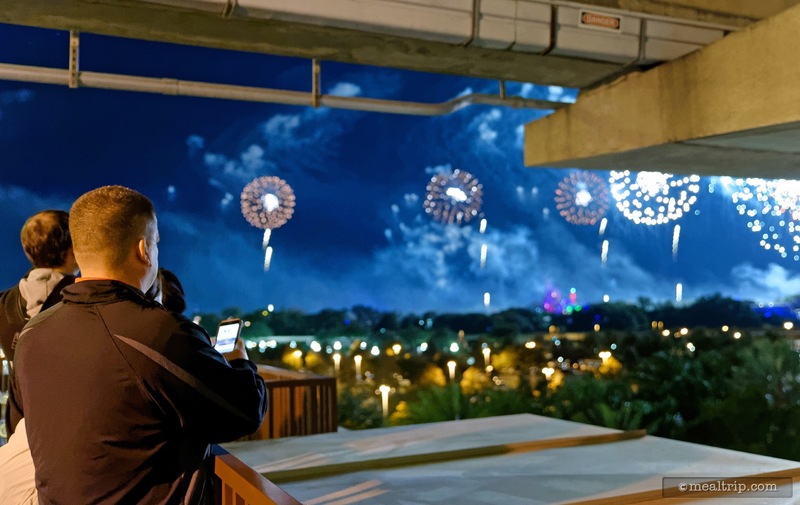 The fourth floor landing deck is a very unique place to watch the Wishes fireworks. 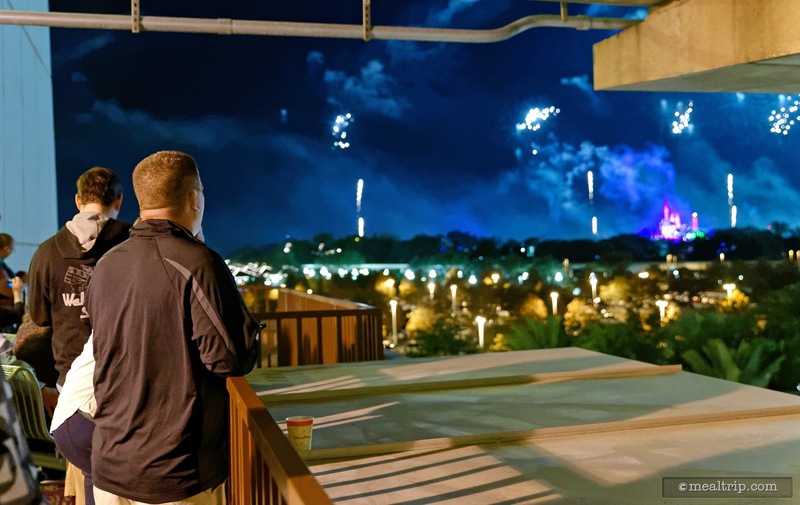 There are no bad views of the fireworks from the 4th floor deck outside the Contemporary. 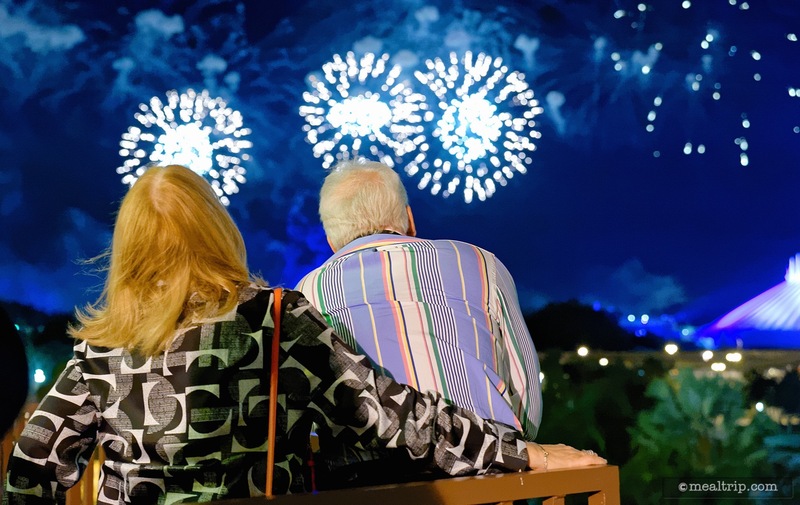 If there is a special party at the Magic Kingdom (such as Mickey's Very Merry Christmas Party), you will get to see all of the perimeter fireworks as well! This really is a unique viewing spot when all of the launch tubes are used. There's even a parting gift! 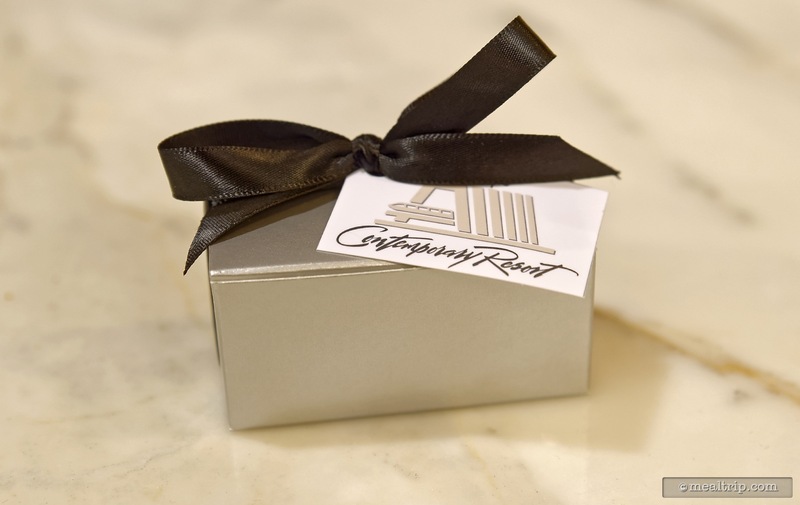 Two little Artisan Chocolates in a box! 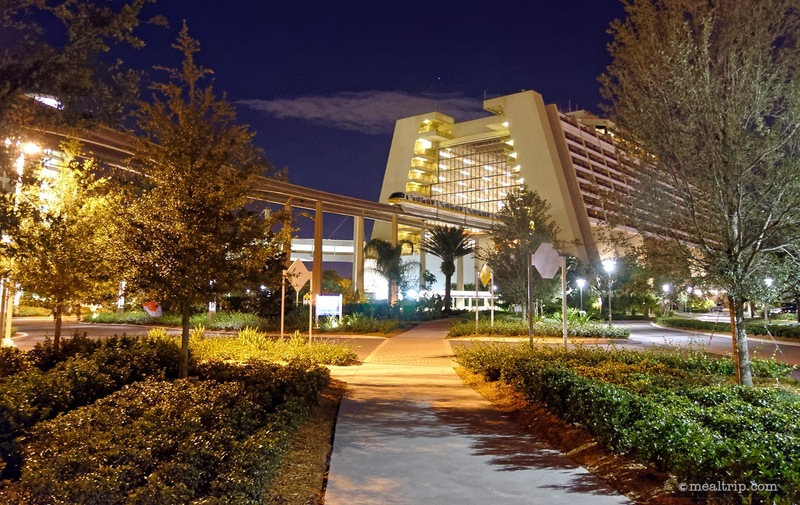 We take one last look at the monorail as it enters the Contemporary Resort at the Highway in the Sky Dine Around event.